A Concurrent Affair | Jenny and Mathias' work and play. Do you guys want to know how to refer to the /instances node under paths using a JSON pointer? ~1 is the escape sequence for /. And ~0 is the escape sequence for ~. I’m really learning more than I want to know. Why ~ and not \, for example? Okay, maybe you don’t want to have a third escape sequence, \\ to denote \. But then, why not ~~ for ~ and ~/ for /? I guarantee you, I will never be able to remember if ~1 is slash or tilde. 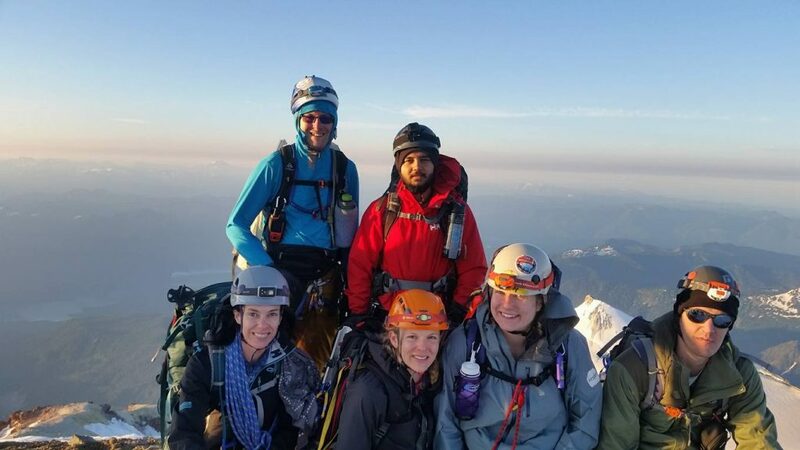 For the last few weeks, some Mountaineer friends, Jenny, and I had been planning to climb Mount Baker, Washington’s 4th highest mountain (if you count Little Tahoma as number 3). The last two weekends, though, we were weathered out. This weekend, the weather looked great, though. We went up the Coleman-Deming route, starting leisurely on Saturday around 10 AM. 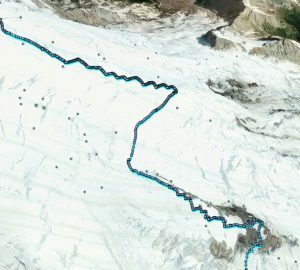 We roped up at the top of the Hogsback, at the toe of the glacier. Snow was very soft. We put crampons on, but in retrospect, they weren’t helpful. 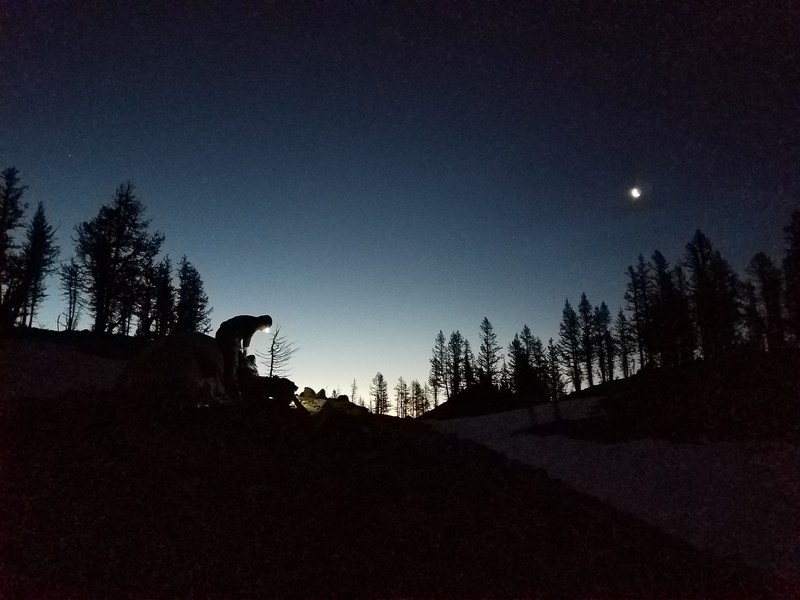 We camped at around 6800 feet, not at the Heliotrope Ridge camp (which was unnecessarily high and out of the way) or at the Black Butte High Camp (which had rock fall and, as far as we could tell, no running water). We had running water, but needed to shovel platforms. Because of the very hot day and soft snow, we got up 11 PM and departed at midnight. We reached the summit around 6:30, but we also went very slowly and didn’t push at all. The snow was perfect styrofoam for cramponing in the morning. We unroped just above the Colfax col and scrambled up the dirt ridge. Upon reaching the snow slope below the Roman wall, we decided to stay unroped. 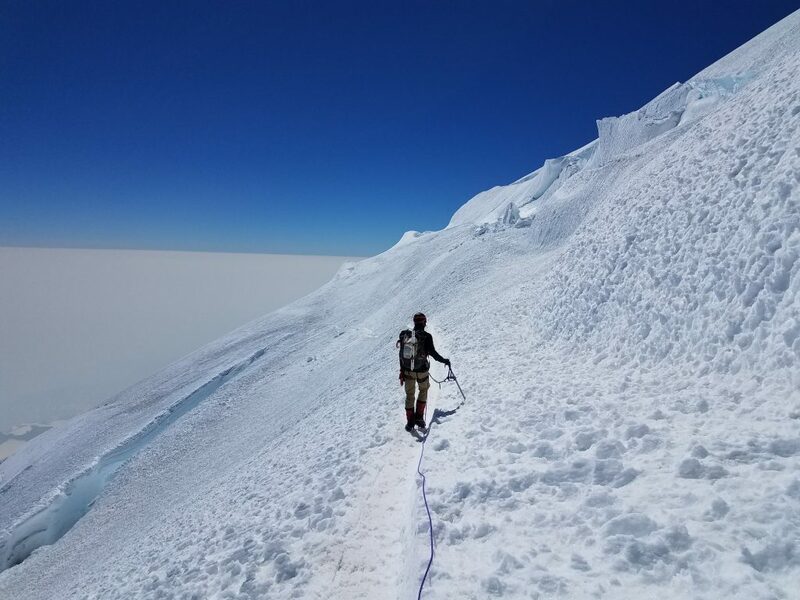 There were no visible crevasses, and we decided it was safer to not pull someone else down on a possible slip (there were lots of teams making questionable rope decisions, like three climbers with about 3 feet of rope in between climbers…). In the end, it was less steep than it appeared from below. I still think we made the right decision to stay unroped. We roped up again on the descent after the pumice portion, just above Colfax col.
After tearing down camp, we roped up yet again, even though the crevasses were tiny, but we wanted to set a good example. Most of us didn’t put their crampons on again. The snow was too slushy at that time (around 1 PM). 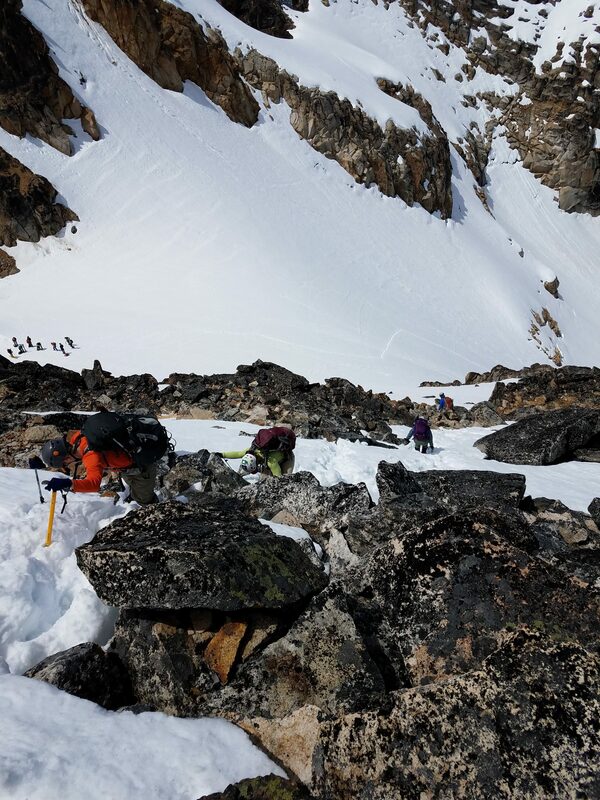 There was new ice fall debris below Colfax peak, and on the way up, my rope team didn’t find the best way through. At around 8320 feet, we headed nearly straight up-slope (south-southeast), when we should have tried to cross the ice fall (southeast). That would have gotten us to a nice flat glacier section again. We found a better way on the descent during daylight. 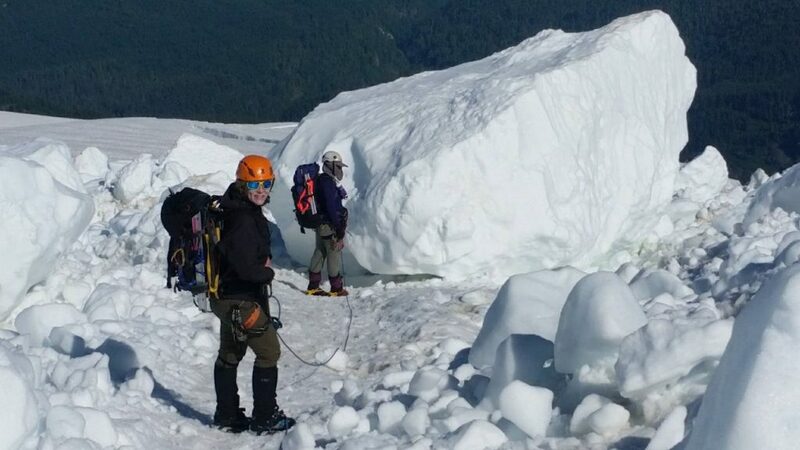 There were a few crevasses, but most of them were small, less than a foot. They started around 6600 feet. The two biggest ones were below the Colfax col, at around 8800 feet. The lower one was several feet wide but had a huge, solid snow bridge across; the higher one was a little over a foot wide and could be stepped over or jumped. 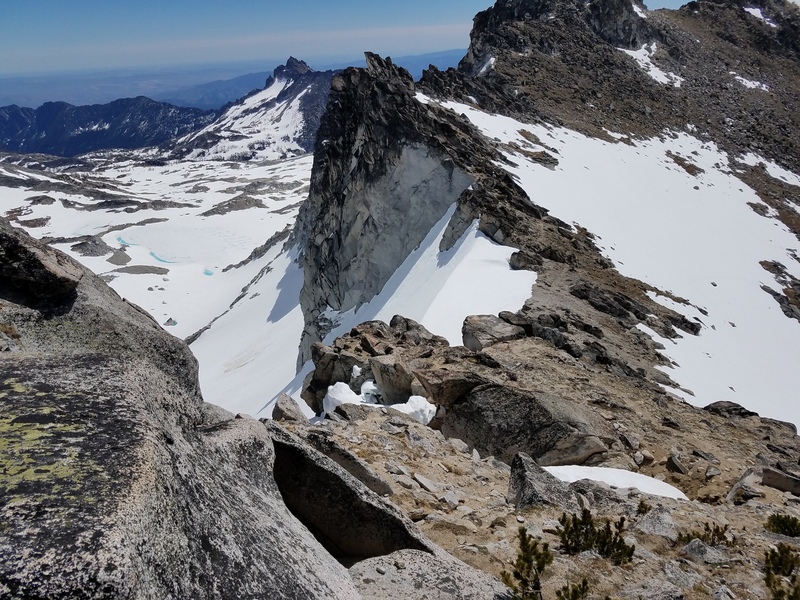 Near the summit rim, a crevasse/bergschrund was starting to form on the climber’s left, but it didn’t reach across yet. The road to the trailhead was in good condition, for the most part, but there were some rather big potholes, and it’s a one-lane road, so my maximum speed was probably about 20 mph. Still, no problem for my Camry. 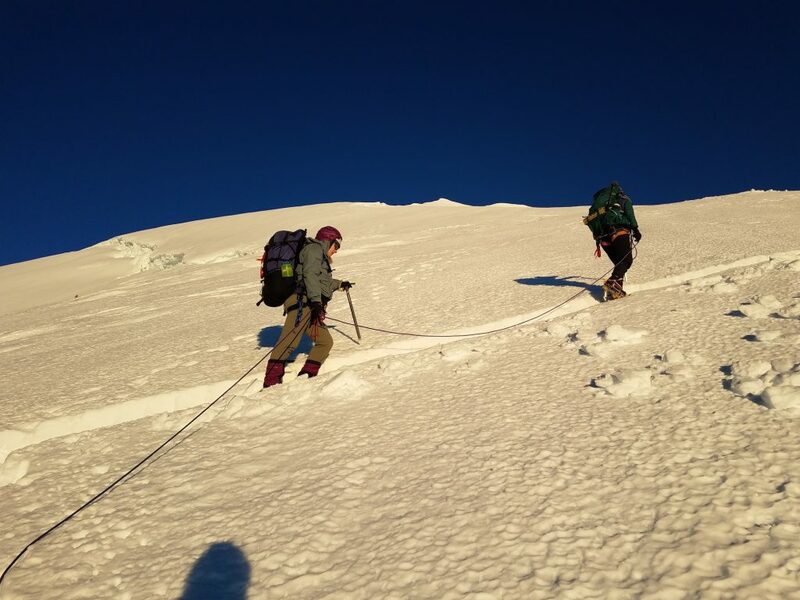 Equipment used: poles (to the top of the Hogsback), ice axe (from toe of glacier), crampons (useful midnight to around 10 AM), rope (40 meter per team of 3, interval 10 meter, with 10 meters coiled on both ends), two pickets per team, standard personal glacier gear, GPS. 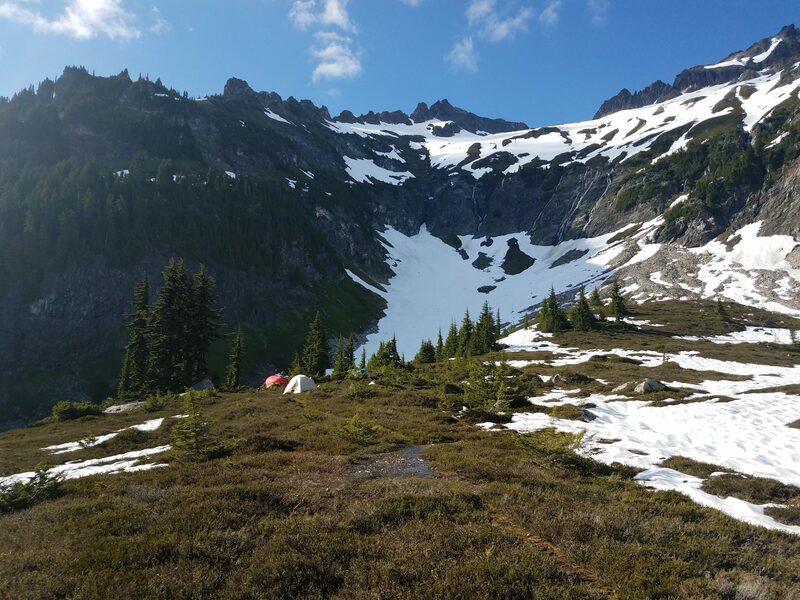 Camp on Saturday at 6800 feet. Photo by Sharon. Rajan descending the snow slope next to the Roman Wall. Descending into the ice fall below Colfax Peak. You can clearly see where the cornice broke. In the ice fall below Colfax Peak. Picture by Vicki. 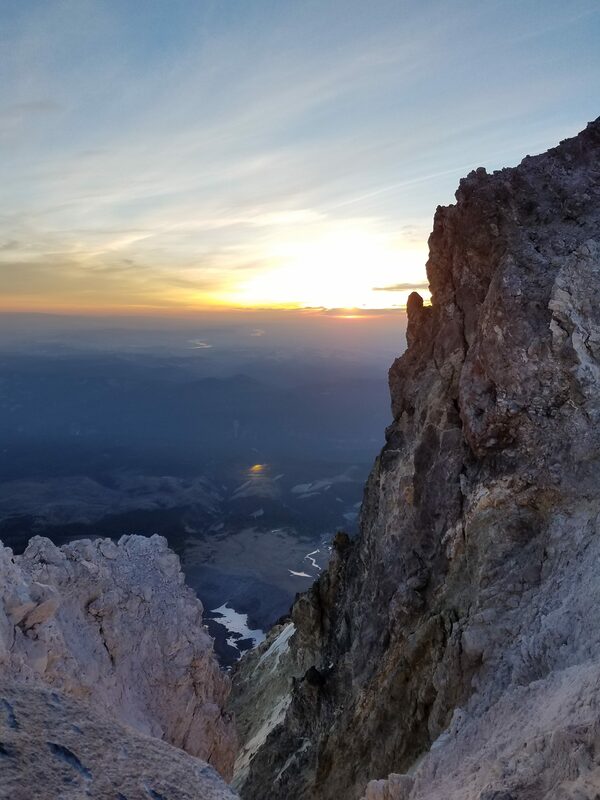 Here are two links to my trip reports on Peakery and PeakBagger. 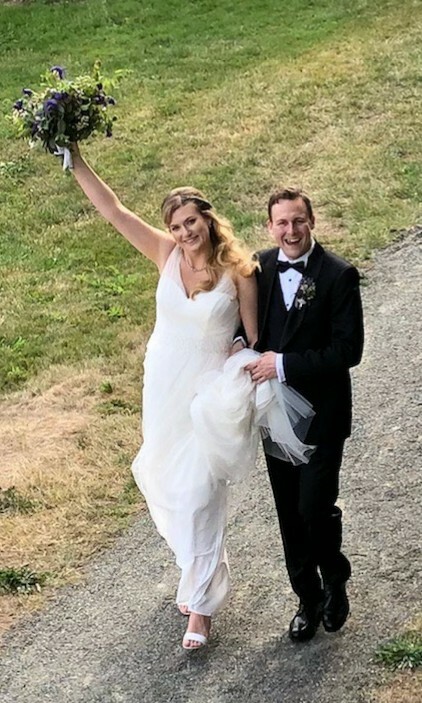 Jenny and I decided not to do an immediate, long honeymoon trip right after our wedding. Instead, we’re going to do a number of trips. 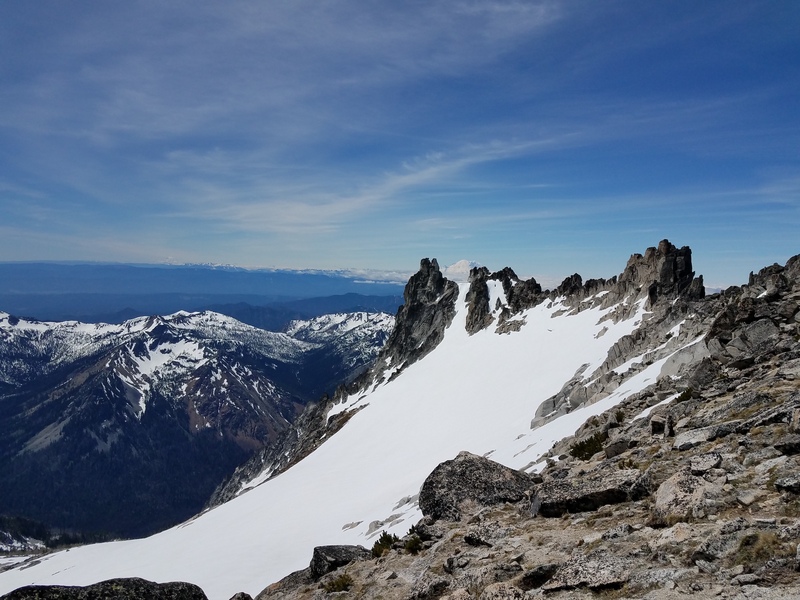 The first one was this past weekend, to Black Peak in the North Cascades. 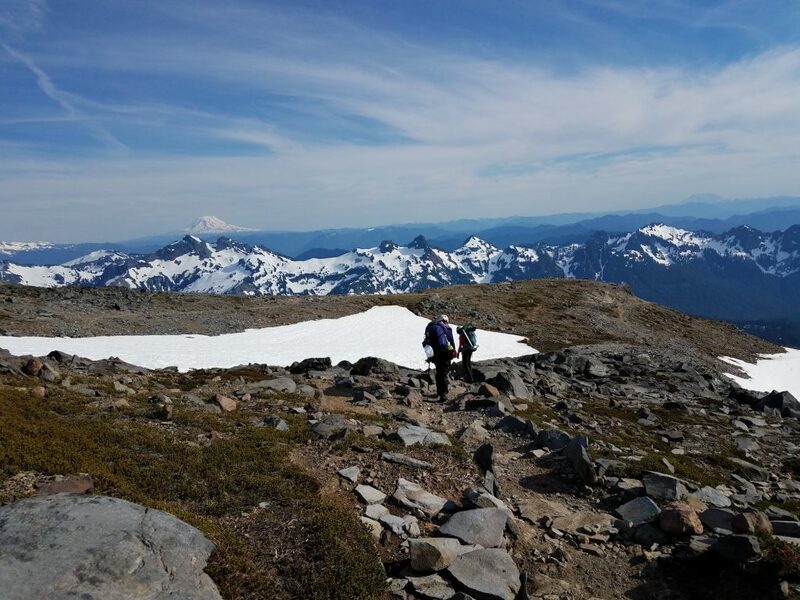 Black Peak is Washington’s 20th highest peak, and we had been talking about climbing it since fall of 2016. The hike in was quite enjoyable, despite carrying our tent and everything else we needed to camp. The trail to Heather Pass was completely snow-free and easy. 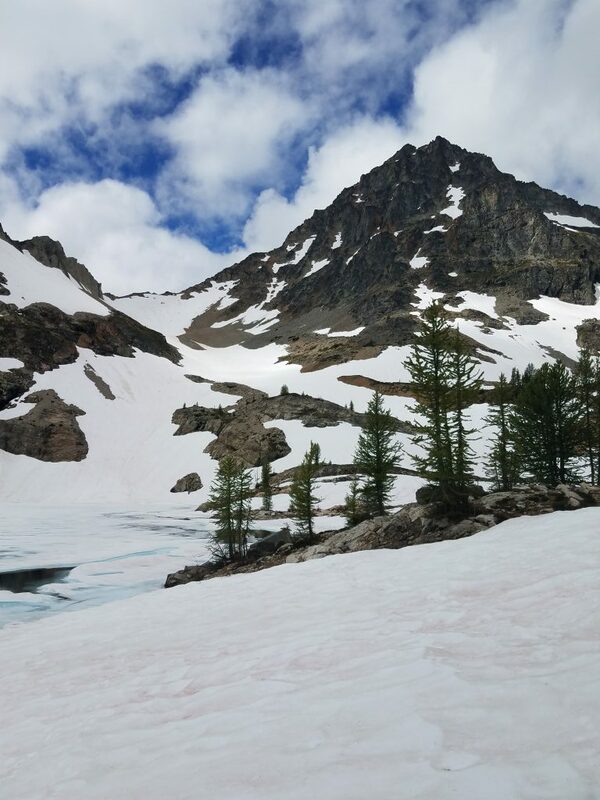 After that, our journey was mostly on snow, with a few boulder fields in between. The summer climber’s trail is beginning to melt out, though. I think in a few weeks, getting to Wing Lake will be even easier. Above Lewis Lake in the North Cascades, on our way to camp below Black Peak. We camped right next to Wing Lake, which was still frozen over with a thin layer of ice. 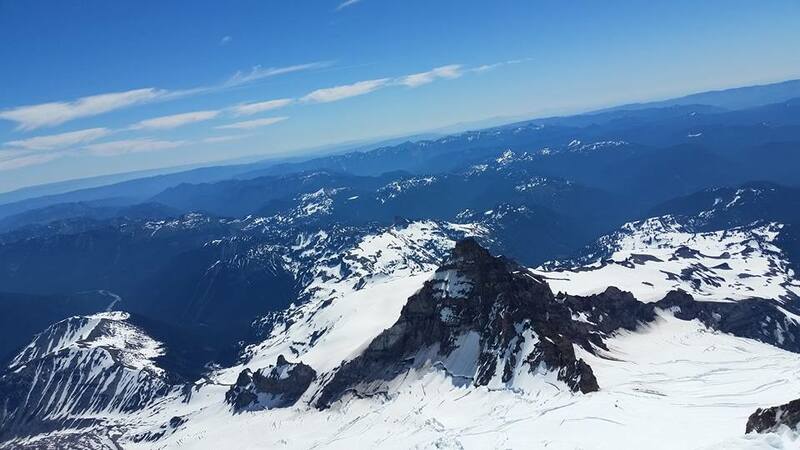 Black Peak, Washington’s 20th highest mountain. Camp at 4 AM for our summit attempt of Black Peak. 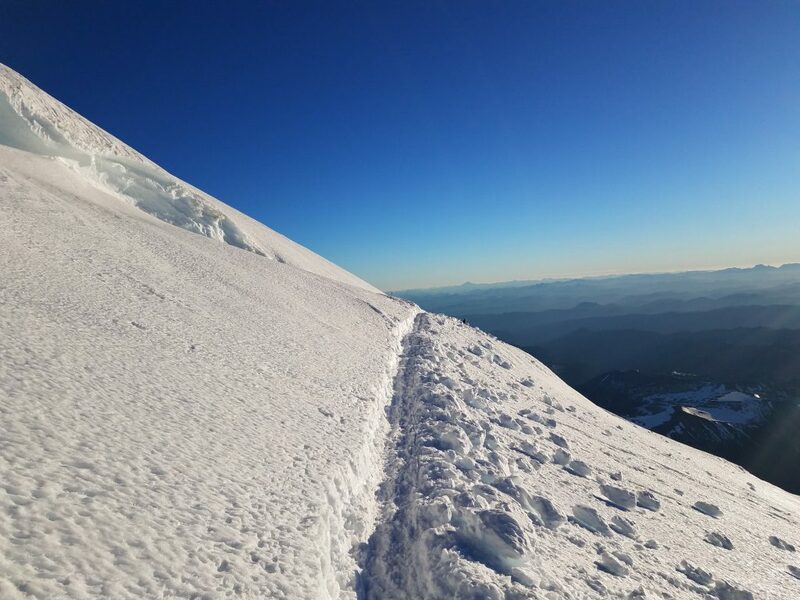 The snowfield below Black Peak’s south col was still solid, and at 5 AM, it was perfect styrofoam snow for cramponing. 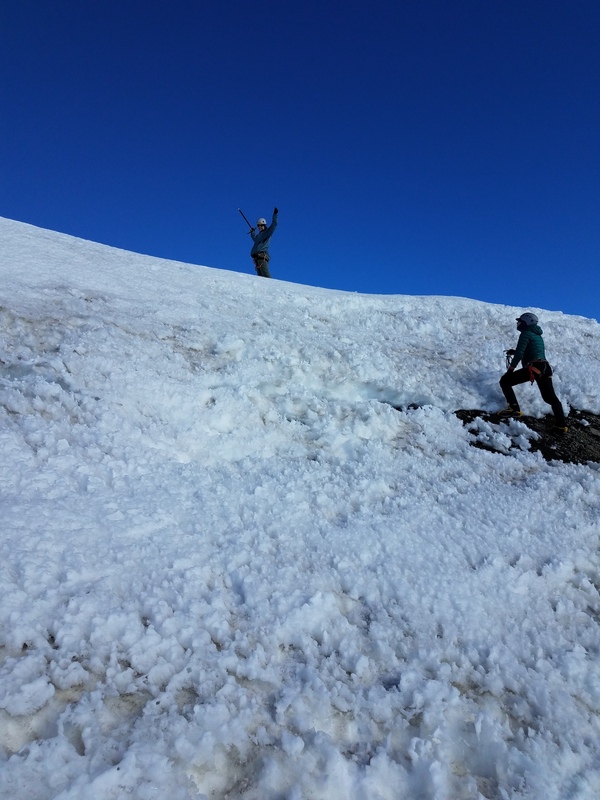 Jenny climbing the steep, frozen snow to the col south of Black Peak. The 900 vertical feet of scrambling were easy for the most part, although we once headed into the wrong gulley and had to downclimb. We were about 50 feet too far to the east. 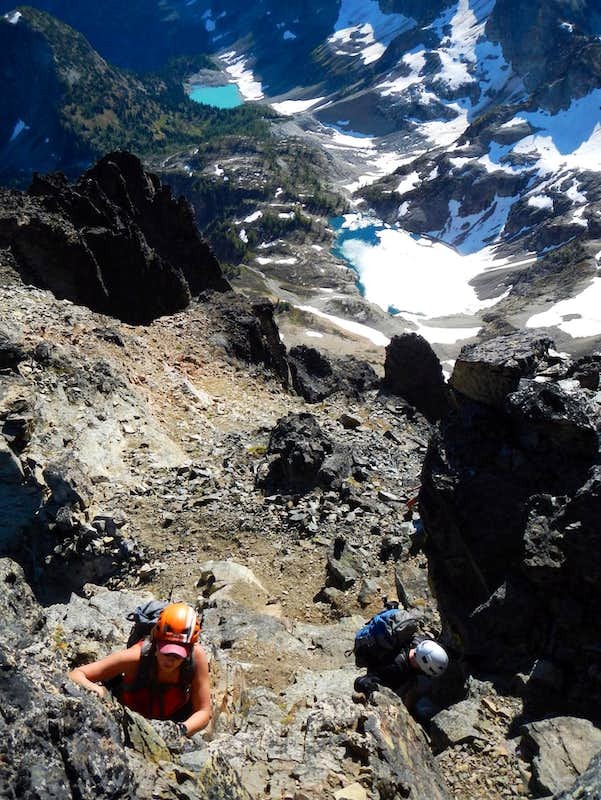 The crux of the scramble was just below the true summit: A steep, unprotected section of three steps, totaling maybe 10 feet (picture from SummitPost, not by us). The rock was solid, and there were a number of good footholds, but the handholds were all on the side, under an overhanging rock protrusion. There was a lot of loose rock on top of the steps. On the downclimb, it was difficult to see the feet into the holds. We managed to find them, but even if we hadn’t, we could have held on to rock protrusion and ungracefully scraped down the rock face. It was probably less dangerous than it felt. The view from the top was gorgeous, and we were happy we didn’t push to climb Black Peak on Saturday, when the weather was cloudy. View from the summit of Black Peak, high above Wing Lake. All in all, it took us four easy hours from car to camp, and three hours from camp to summit. We were back at camp before 10 AM, tore down and left camp at 11 AM, and were back at the car at 2:30 PM on Sunday. It’s been a little harder for me to get out into the mountains this year. It’s already end of May, and I don’t have much under my belt. 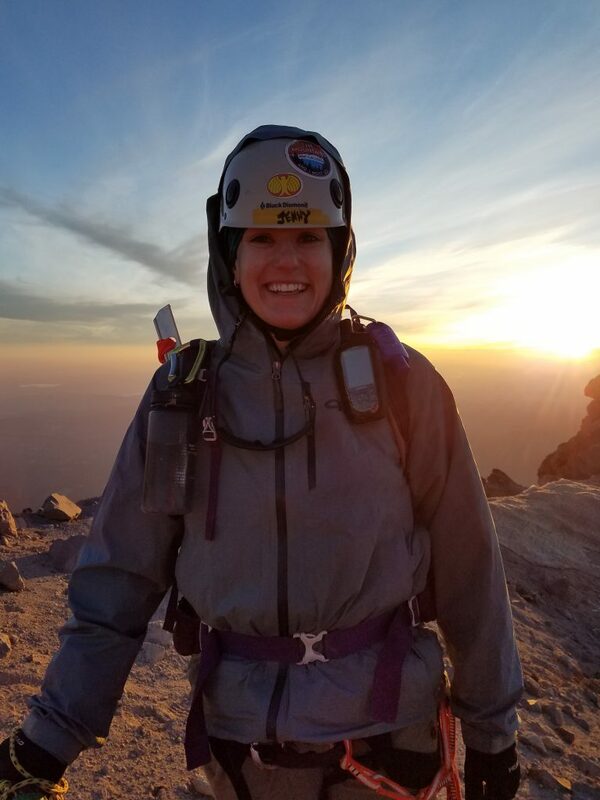 That’s why I’m even more excited that Jenny and I climbed Dragontail Peak last Saturday. 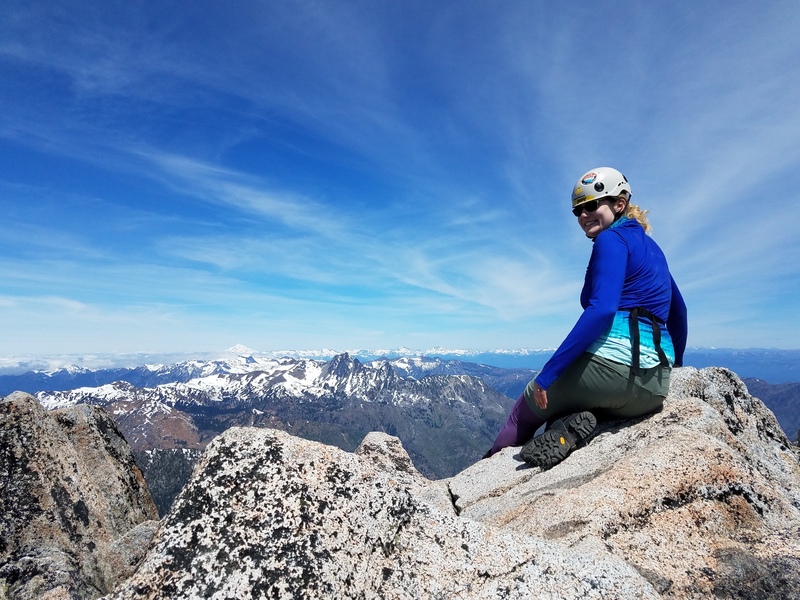 Dragontail is 26th on the Washington Bulger List of Washington’s highest mountains, and it has been a goal for Jenny and me ever since we first set foot in the Enchantments. 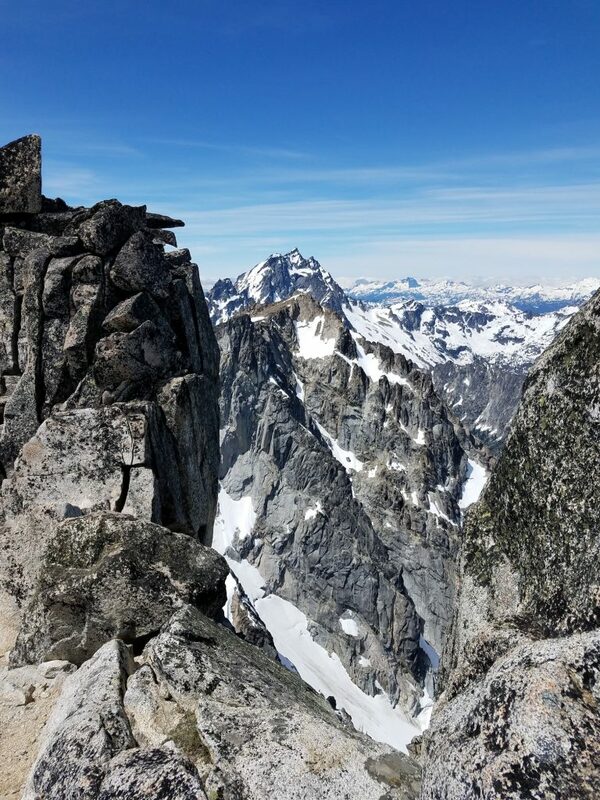 Last year, we climbed its neighbor, Colchuck Peak (33rd on the list). 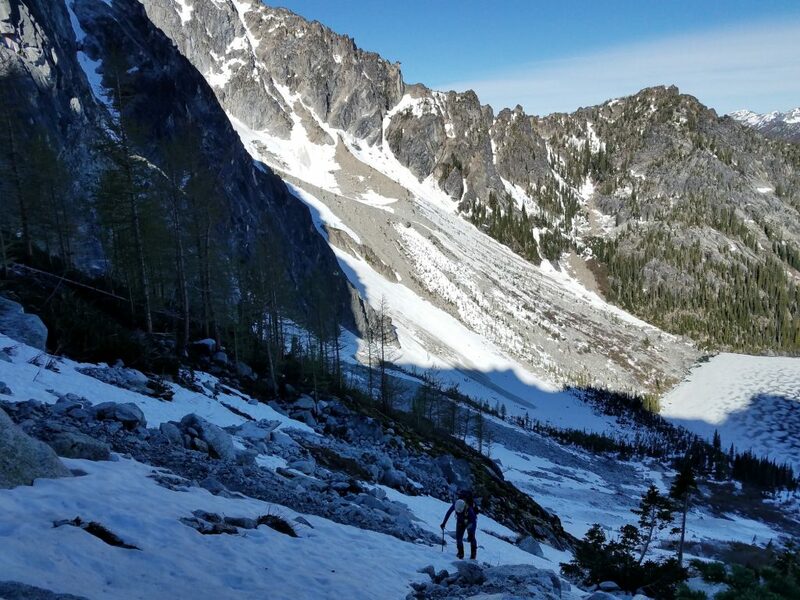 We had permits at Stuart Lake, since I had originally planned to climb Mount Stuart, but for that, I simply wasn’t in good enough shape. 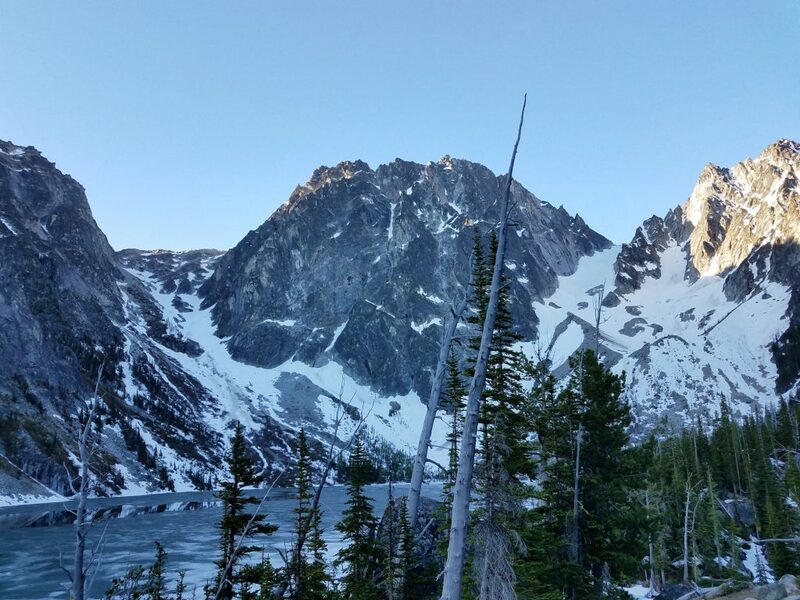 So instead, we camped at Stuart Lake, then Saturday morning at 4 AM hiked to Colchuck Lake, around the lake, and then up Aasgard Pass. We were at the top of the pass around 10:30 AM and turned west-southwest towards Dragontail’s key col. From there, it was a simple scramble to 8,845 feet. I had trouble standing up on the summit, the exposure felt so threatening. Perhaps my fear wasn’t quite unreasonable, considering Dragontail Peak drops 3,300 feet down to the lake, almost vertically. It was a pretty amazing spot. We could see Rainier, Adams, Baker and Glacier Peak. Just St. Helens was hiding in the clouds to the south of Rainier. I haven’t been to many five-volcano spots before. 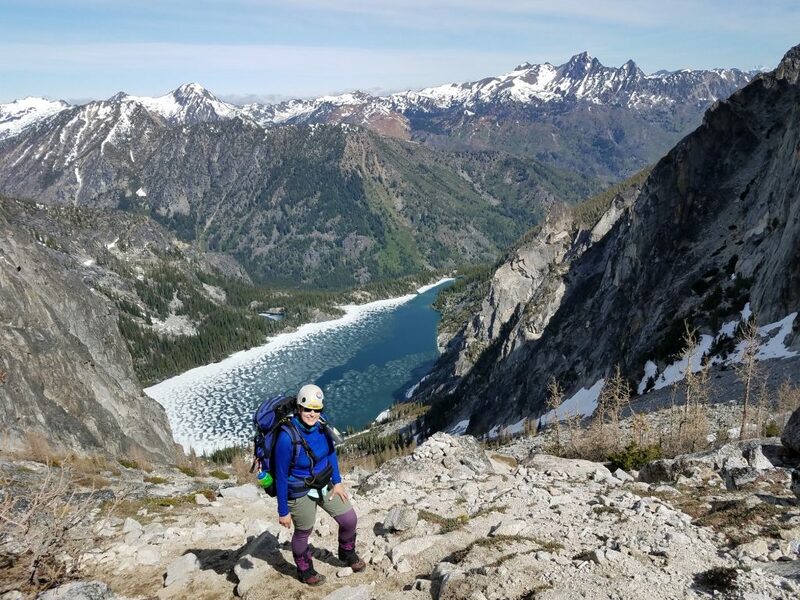 We had originally planned to head south and through Pandora’s Box, so we could glissade down the Colchuck glacier, but the snow going up Pandora’s Box was too soft. 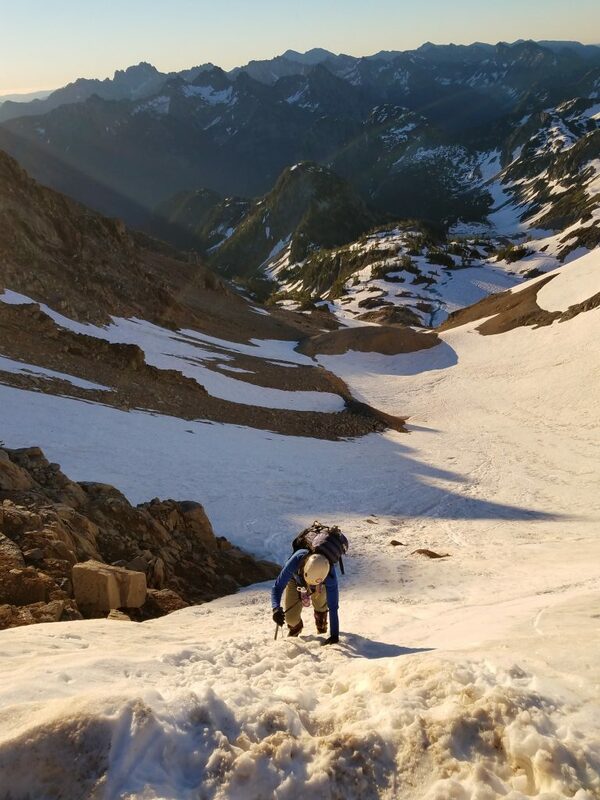 We decided it was safer, albeit much more annoying, to hike down Aasgard Pass. We were back at our tent just before 8 PM. It was a strenuous but successful, and even enjoyable, trip of almost 16 hours. Dragontail Peak from Colchuck Lake. 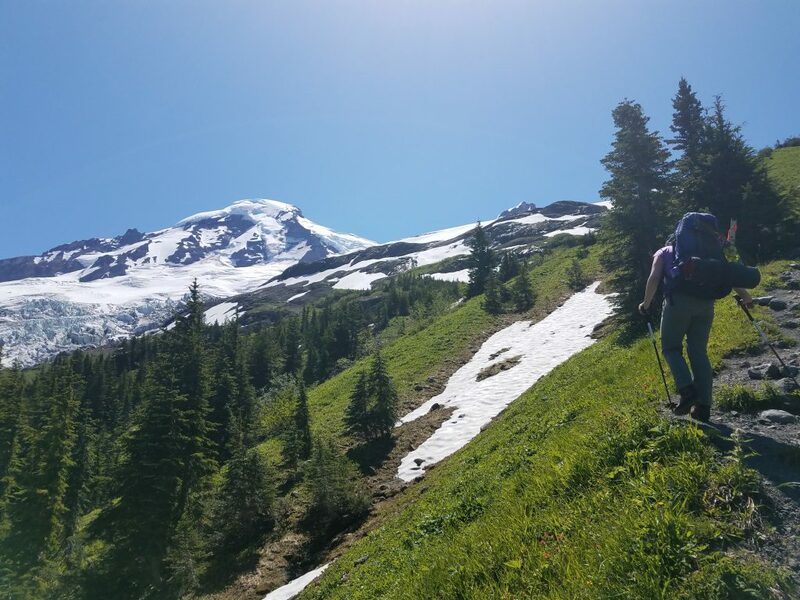 Hiking up the lower slopes of Aasgard Pass. Scrambling near the top of Aasgard Pass. Heading towards Dragontail’s key col. 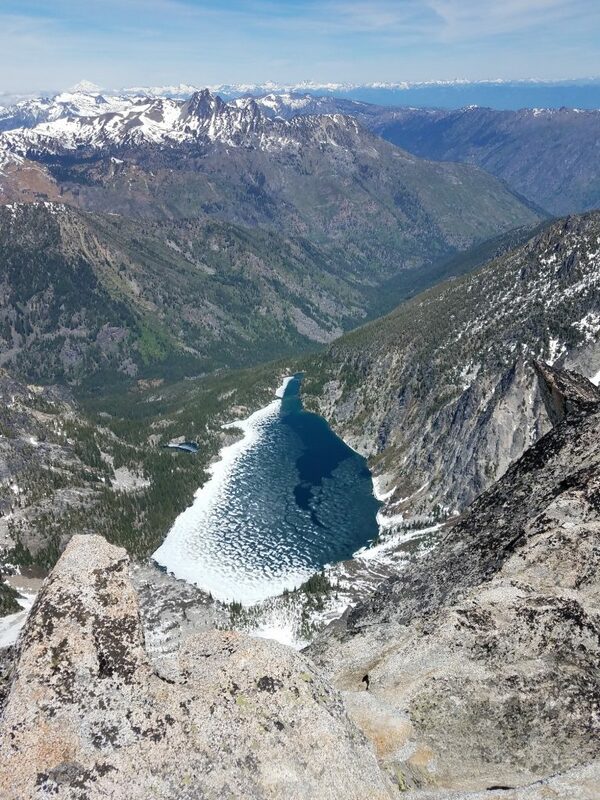 Looking into the core of the Enchantments. Aasgard Pass is below in the background. On the key col, with Rainier and Adams visible. Looking back at the key col, after just having started the summit scramble. Looking at Pandora’s Box, with Rainier right behind it. The sharp cliffs on the east side of Dragontail. Jenny enjoying the summit. Glacier Peak in the background. Looking 3,300 feet down to Colchuck Lake. I would really like a Lombok @Builder annotation that properly deals with required parameters at compile time. So basically, if we have n required parameters, we 2^n builder classes. 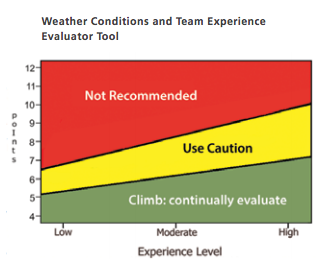 For each r required parameters that have been set already, we need n-choose-r builders. In the example above, we have three required parameters. We have one builder that has no required parameters set, three that have one value set, three that have two values set, and one that has all of them set. Unfortunately, the source code for rewriting the bytecode in response to a @Builder annotation is almost 1000 lines long. Not exactly the best example of well-structured code. Now that Amazon Music is shutting down the ability to upload and play your own songs, what do you use as a replacement? I have hundreds of CDs that I imported — complete Mike Oldfield, almost complete Depeche Mode, lots of classical music of which I’ve found one performance I prefer. How will I get those to play on my Amazon Echo devices and my Android phone? In preparation for the WTA’s Northwest Exposure photo contest, I was reviewing my favorite pictures from this year, just like I did last year. But there are just too many this year. I’ve been to so many gorgeous places, gone on so many amazing trips, I just have a really hard time reducing my set of photos to just a top 5. With a lot of heartrending, I think I can manage to cut it to a top 12. 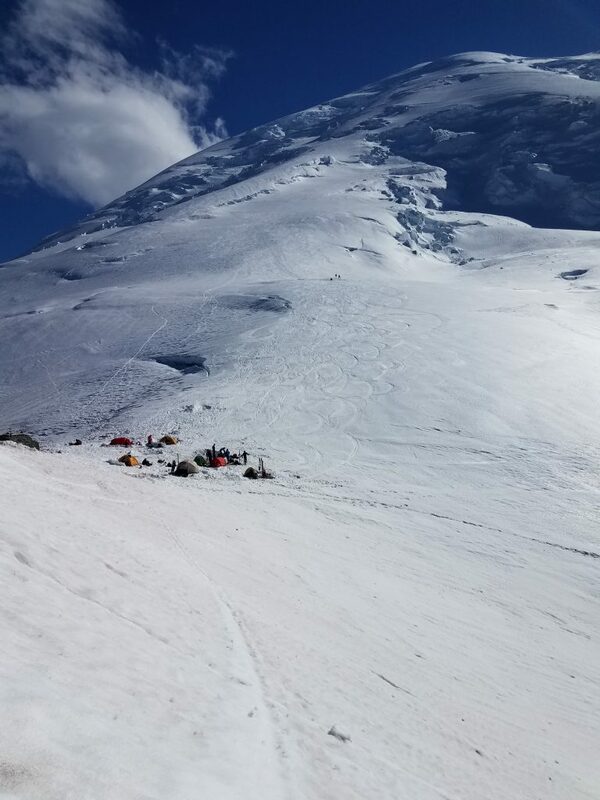 Camp Schurman, in front of Mount Rainier. 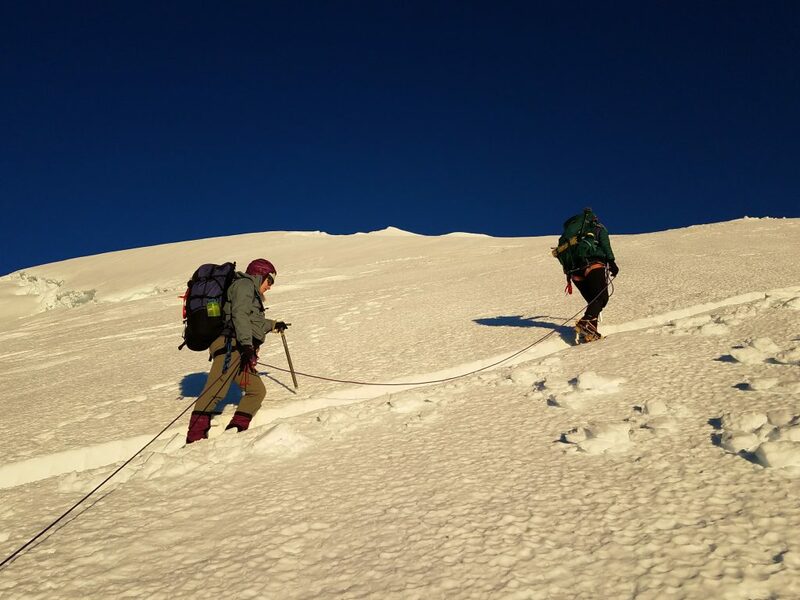 Climbers on the Emmons route to the summit of Mount Rainier. Sunrise at Camp Schurman, Mount Rainier. Mountaineers descending Silver Star Mountain. 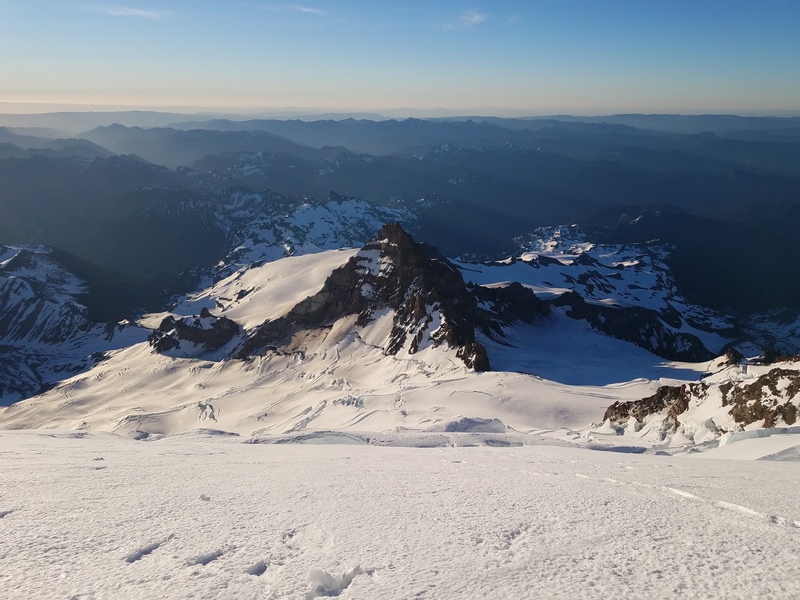 Mount Adams and Mount Hood, seen from Mount Rainier. Mountaineers on the Emmons Glacier of Mount Rainier. 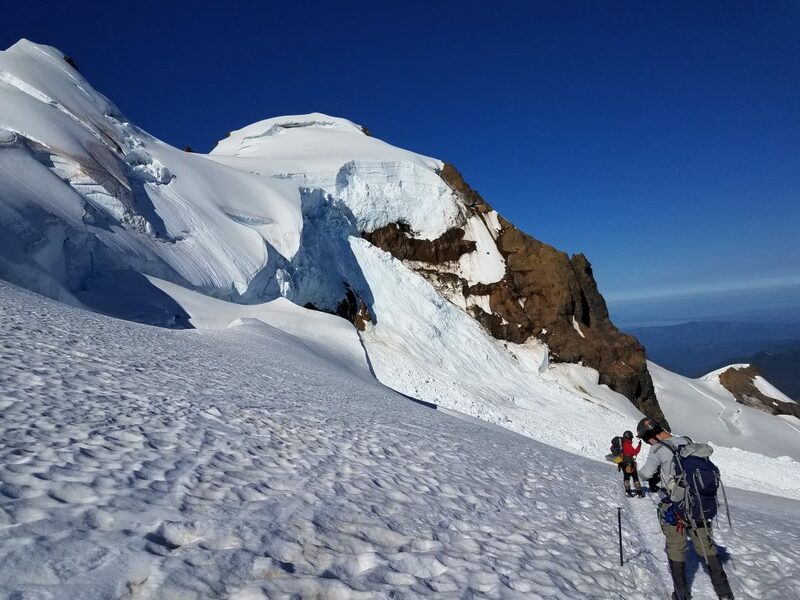 View from the “Sidewalk” of Dome Peak, with climbers on the Dome Glacier. 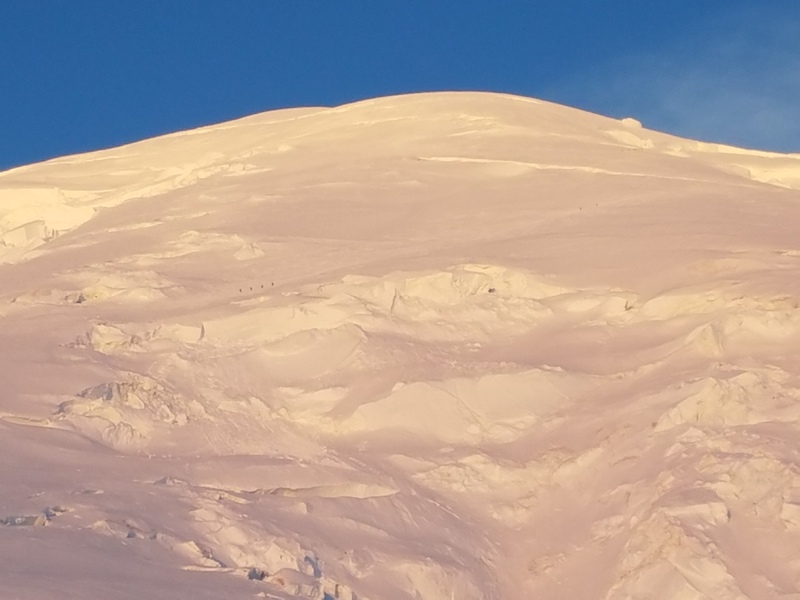 Mountaineers and penitentes at sunrise on Mount Rainier. 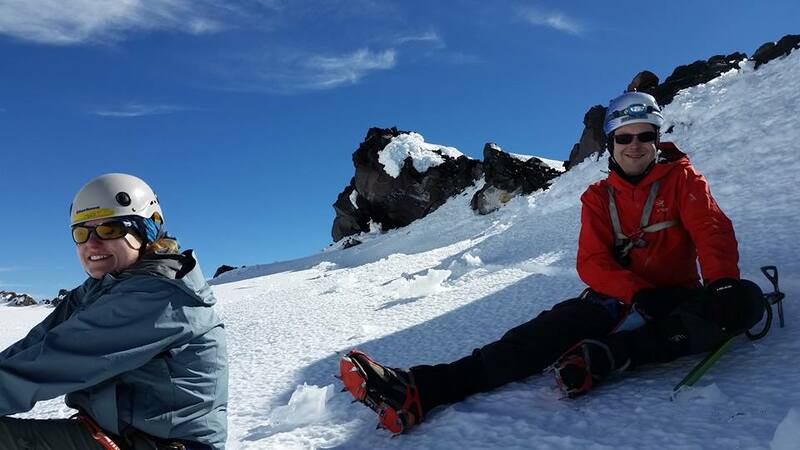 On the Winthrop glacier on Mount Rainier. 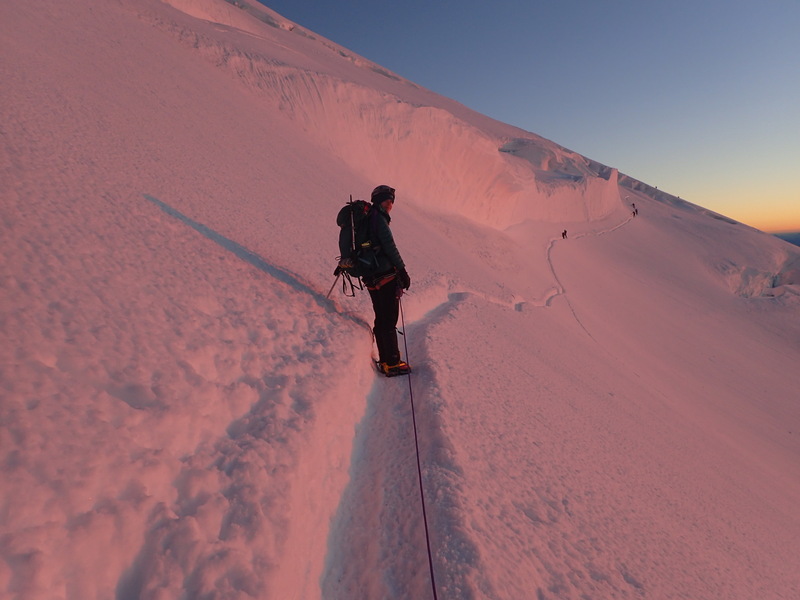 Summit block of Mount Hood at sunrise. Exploding with sunlight near the summit of Mount Hood. 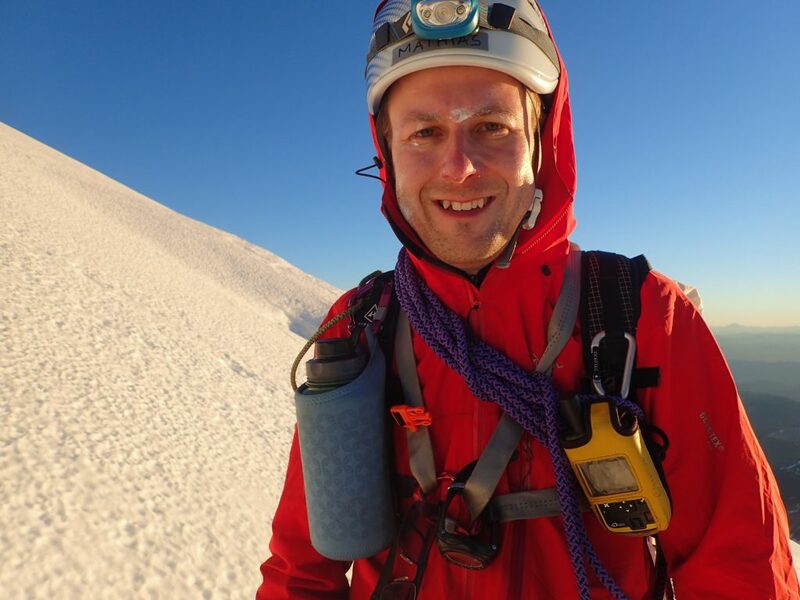 We’ve been shopping around for a handheld GPS, since many climbs require the ability to retrace our route. Since I have an InReach SE, it made sense to check out the InReach Explorer+, which combines a satellite messenger with topographic maps. 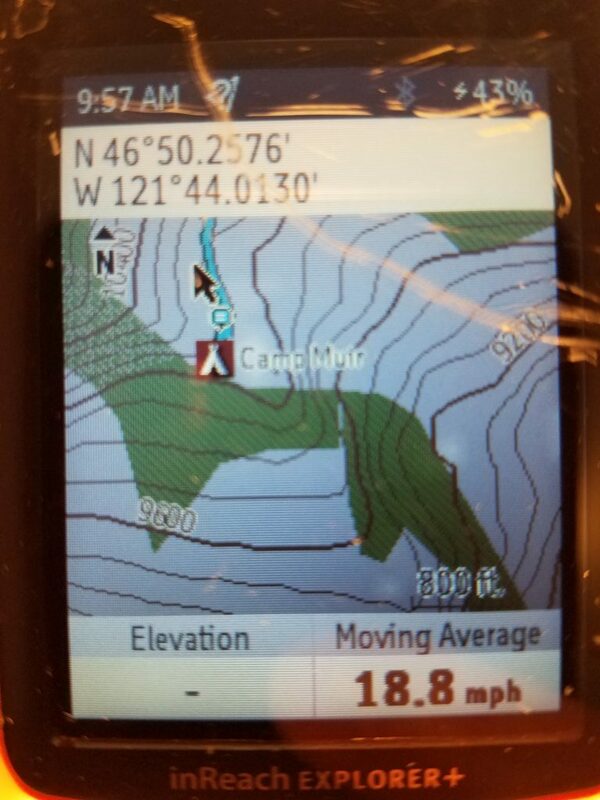 We also tried out the GPSMAP 64st. Both devices are by Garmin. We took both up on our August climb of Mount Rainier. The InReach Explorer+ is nice, since it means we only have to carry one device, instead of a messenger and something with topographic maps. Unfortunately, in terms of map detail and accuracy, it is quite far behind the GPSMAP 64st. You can see that the track on the InReach is much less uniform, and there are a few points that are actually quite far away. 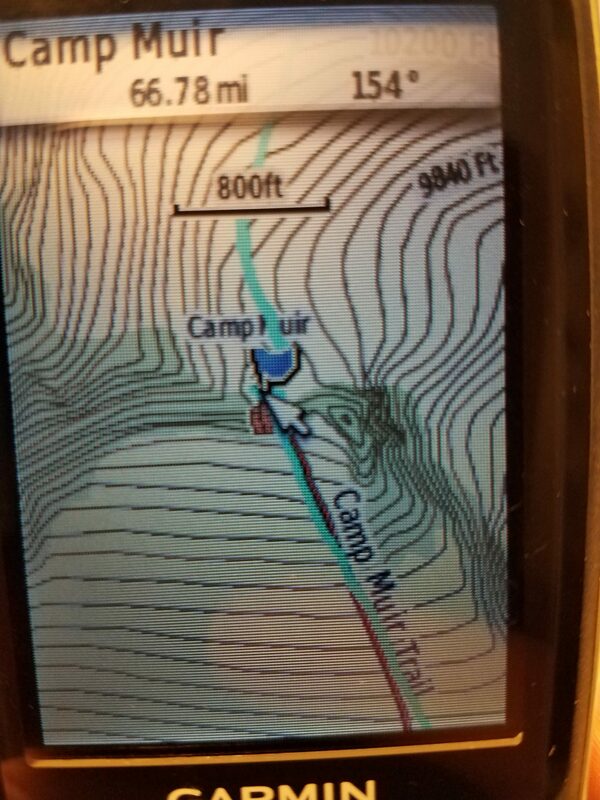 You can’t even see Muir Peak, to the east of the camp! I think we’ll return the InReach Explorer+ and keep the GPSMAP 64st. We just have to figure out a way to keep the latter from turning on accidentally and draining the battery. I’m using Kaspersky SafeMoney to redirect requests to websites that deserve a bit more security to a sandboxed browser. I don’t have any extensions in it, except for LastPass. I think it makes sense to still get the benefits of a strong master password and different strong passwords for each site that I don’t have to remember. Unfortunately, when I added Yubikey to the mix, LastPass started asking me for the Yubikey every time the secure browser launches. The option to “trust this browser for 30 days” doesn’t seem to do anything anymore. Has anyone got this to work? 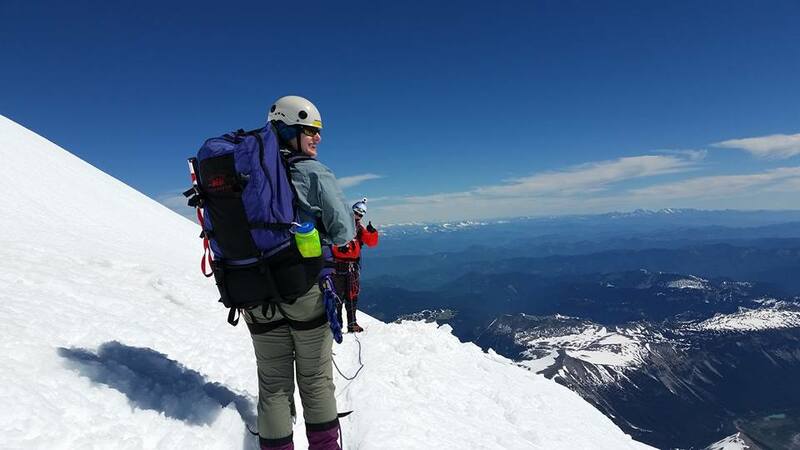 On August 4 and 5, Jenny and I climbed Mount Rainier again, this time with Tatiana, Daniel, and Ian. 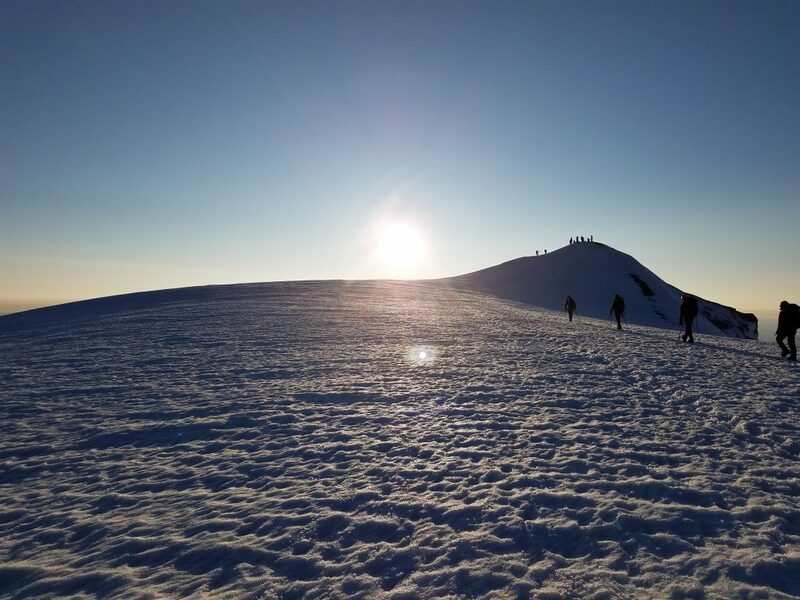 I’m going to write a longer trip report again, but here are a couple of 360-degree pictures from the summit, and a 360-degree video from crossing a crevasse using a ladder. It was another great trip! For a hack day at work, I’ve been trying to integrate our code generator into the online Swagger editor and generator. Of course, I’ve been trying to use the latest version, which appears to be 2.3.0-SNAPSHOT (although I just saw there’s also a 3.0.0 branch). Unfortunately, it seems like inheritance (which is kind of a big deal for actual software systems) is fundamentally broken in 2.3.0.
description: "This is a sample server Petstore server. You can find out more about Swagger at [http://swagger.io](http://swagger.io) or on [irc.freenode.net, #swagger](http://swagger.io/irc/). For this sample, you can use the api key `special-key` to test the authorization filters." 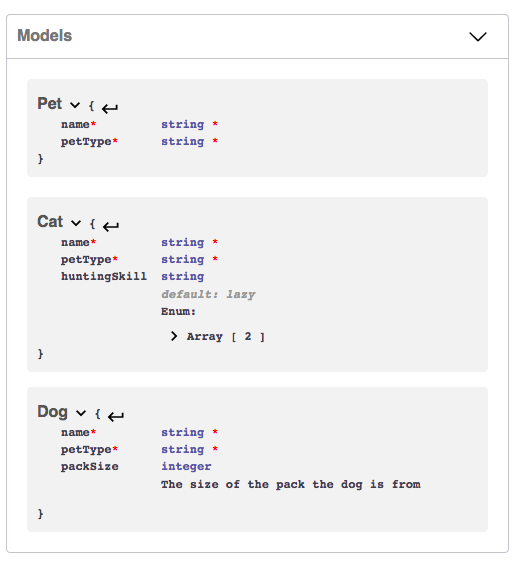 summary: "Find pet by ID"
description: "Returns a single pet"
Cat and Dog extend Pet. Very simple. The latest editor, unfortunately, does not! I’d like to say I began to adopt two-factor authentication pretty early. I’ve had it enabled for Google for a long time, I jumped on it when Amazon and Dropbox made it available, I enjoy it on several of my banking accounts, of course. With all of the recent hacks and ransomware attacks, I decided to beef up security at home as well. I ordered two Yubikeys, a primary one and one to lock away as a backup. As primary Yubikey I chose the Yubikey NEO, which has NFC and can be used with a phone. As backup, I chose the cheap Yubikey FIDO U2F key. Unfortunately, the results are a mixed bag. Yubikey for LastPass requires LastPass Premium ($12 a year, plus taxes). I signed up, then found out that LastPass Premium does not seem to support the cheap Yubikey FIDO U2F key. So I couldn’t use that one as a backup for LastPass. KeePass on Windows has a plug-in that allows a Yubikey to provide one-time pads (OTPs). Again, this doesn’t work on the cheapest key. Also, it’s a bit cumbersome, since it requires at least three presses of the Yubikey button, for three separate OTPs. Initially, I had also configured this for 2nd slot on the Yubikey, which meant I had to hold the button for three seconds, three times (the 2nd slot is triggered by a 3-second press; the first slot is triggered by a simple press of the button). I also used KeePassDroid on my phone, and that app plain and simply does not support OTPs at all. I could have programmed the NEO for a static password, though. There is a newer app, KeePass2Android, that does apparently support getting OTPs from a Yubikey NEO, but I haven’t tried it yet. LastPass on Android does support the NEO, but with NFC, you cannot switch which slot is going to be used. By default, it’s always slot 1. That means I can’t use NFC for both LastPass and KeePass2Android, because both would be using the same slot, and that doesn’t work. So, I have hardware two-factor authentication in a bunch of places now, but I’m not sure I’ve added that much security. I strengthened some of my most important passwords, though. Maybe that “something you know” part is still most important after all. Decision Matrix: 5 or lower means “go,” 6 or 7 means “cautious go,” and 8 or higher means “no-go” for us. 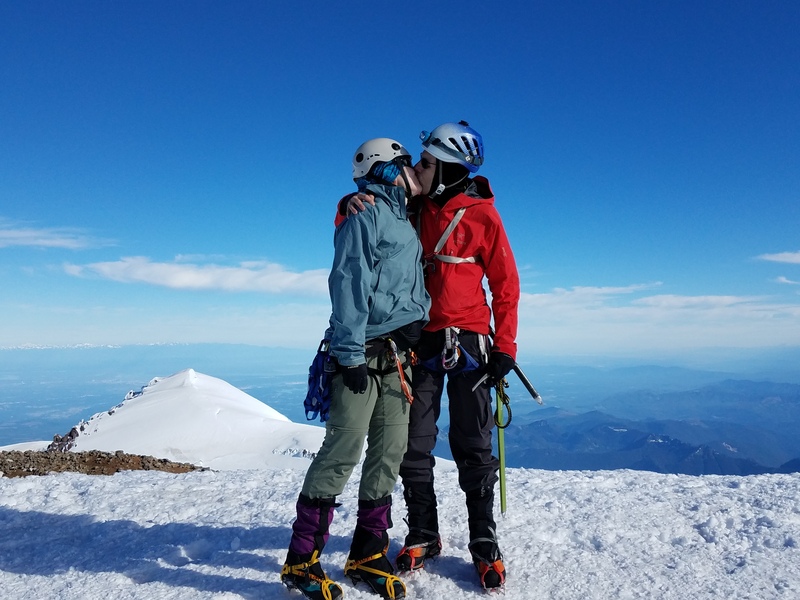 On June 24 and 25, 2017, Jenny and I and our friend Vicki climbed Mount Rainier. 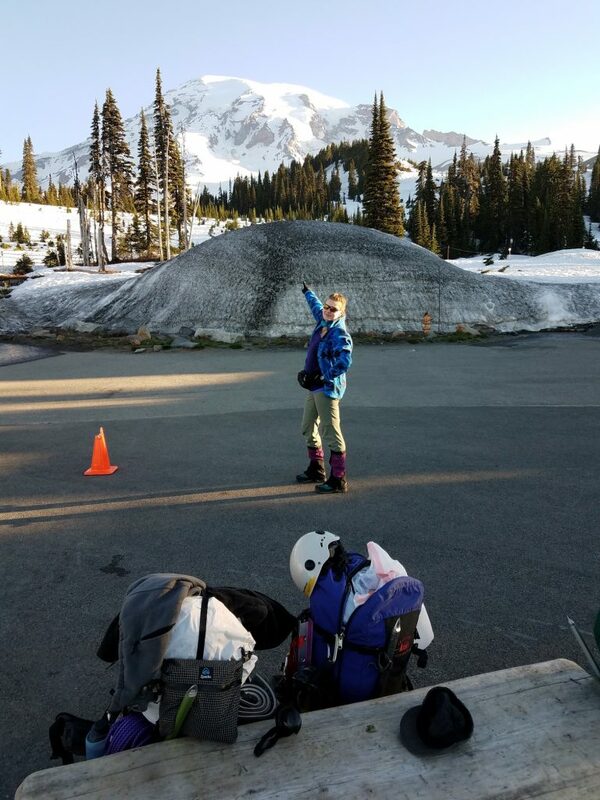 Jenny and I drove out on Friday afternoon and picked up our wilderness camping permit for Camp Muir. We had dinner at the Paradise visitor center (a first for me), and then drove down to Cougar Rock campground to sleep. We drank half a gallon of water, peed like crazy, but got about 7.5 hours sleep in and felt very hydrated in the morning. 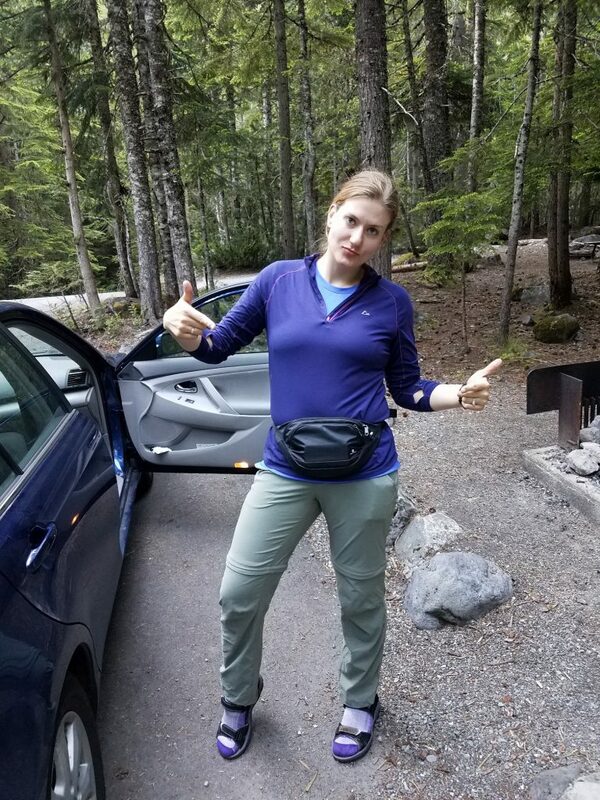 Jenny at our camp site on Friday, excited about her fanny pack. At 4 AM, we packed up our tent and drove back to Paradise. Once there, we finished packing our backpacks and waited for Vicki to arrive, who was on time. 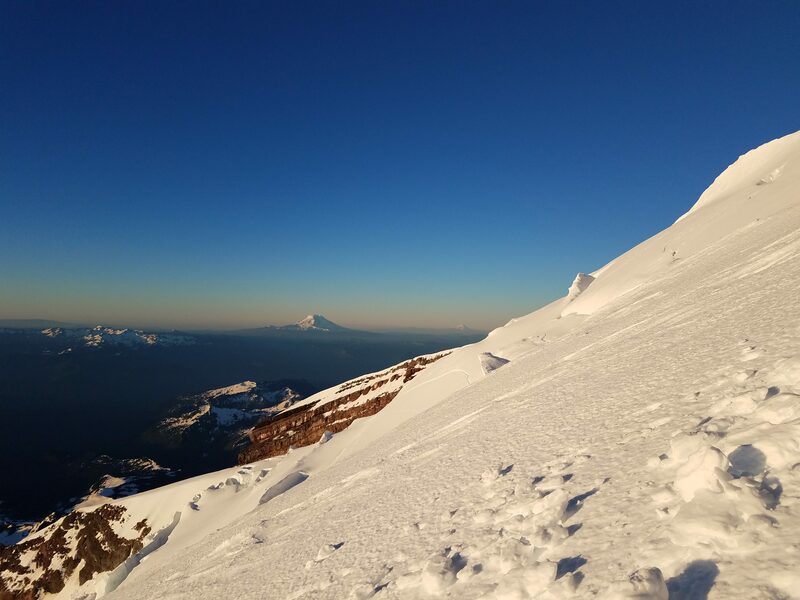 At 6:30, we started hiking up towards Camp Muir, just as planned. Jenny says “we go there” on Saturday morning. There was snow all the way down to Paradise, and the summer route with the switchbacks past Panorama Point had not been cleared yet, which meant we had to ascend the steep slope just below the toilet at Panorama Point (which actually exists; I had never seen it before, since I had always taken the High Skyline trail). That was the only steep part, though. After that, we were on the long but relatively gentle Muir snowfield. 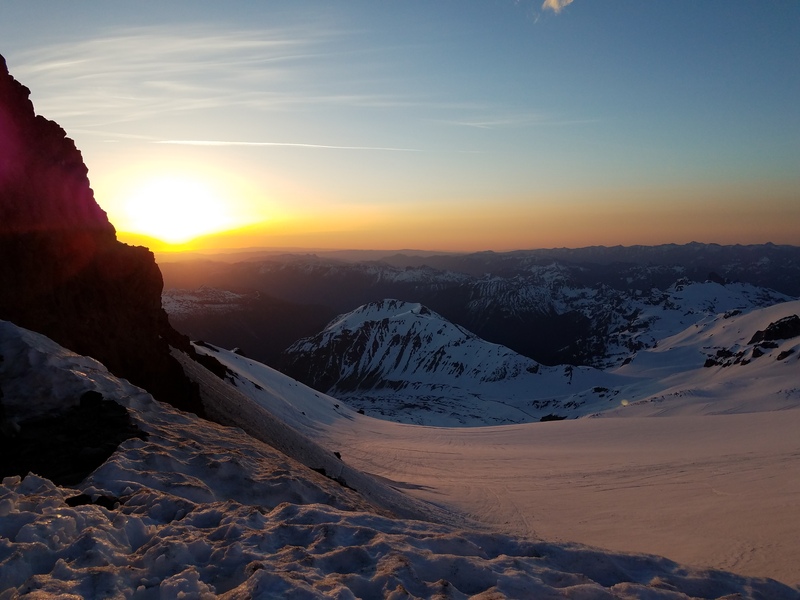 It took us about 6 hours to get to Camp Muir. 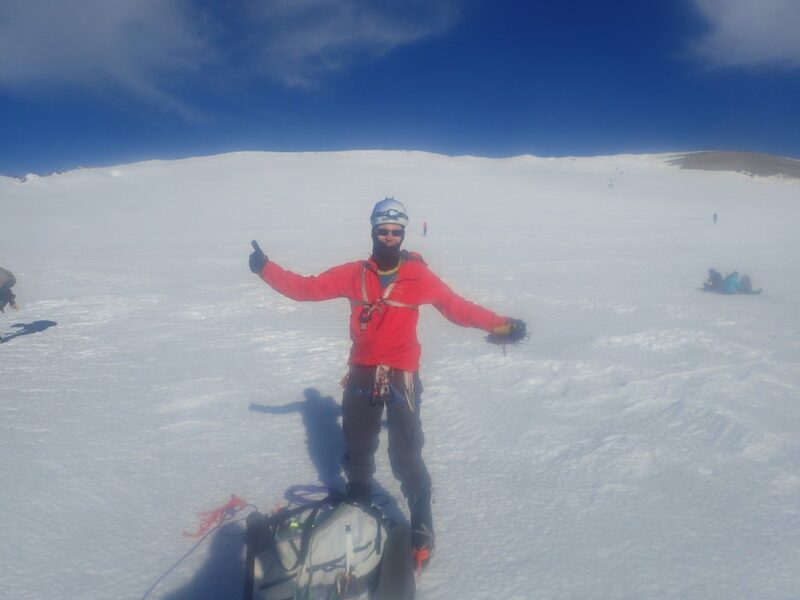 At around 11, we heard from our three skier companions who were going to make up the second rope team. Jenny and Vicki on the hike up, still close to Paradise. Jenny, Vicki, and some other folks heading up the steep slope to Panorama Point. 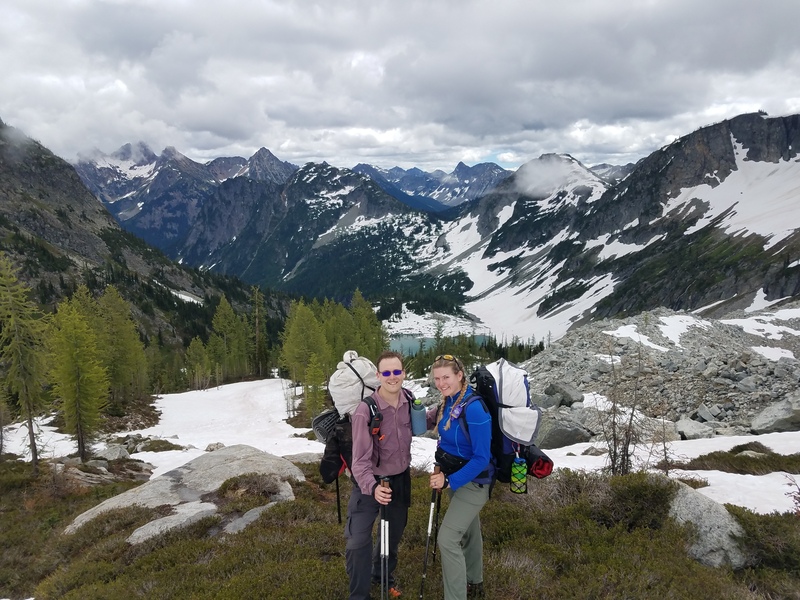 Jenny and Vicki near Pebble Creek, the beginning of the Muir Snowfield. Heading to basecamp, with a heavy backpack (picture by Jenny). 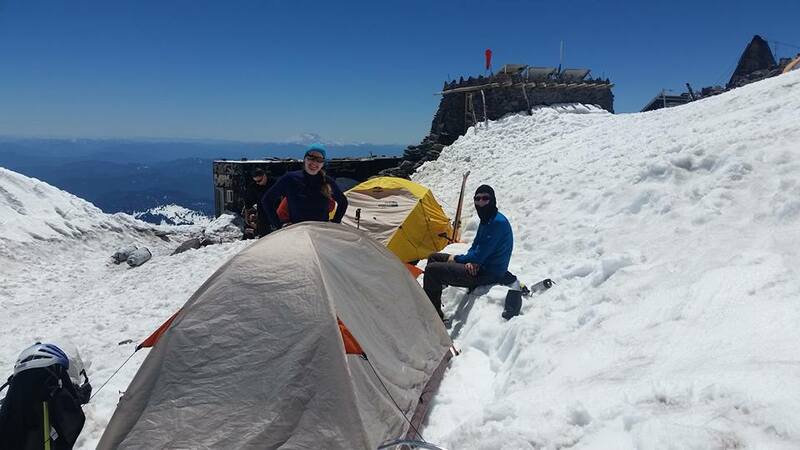 At Camp Muir, we set up our tents and were pretty out of breath, due to the thin air. Vicki hadn’t slept much the night before, and took a nap in her tent under the beating sun. Jenny and I spent about 3 hours melting snow for water, producing about 2 gallons. We also received about another gallon in donations from climbers who were departing Camp Muir. In the middle of this task, we also ate some chicken with rice and teriyaki chicken freeze-dried meals. Then we went to sleep. Or tried to. It was hot and loud. Our earplugs were very useful. 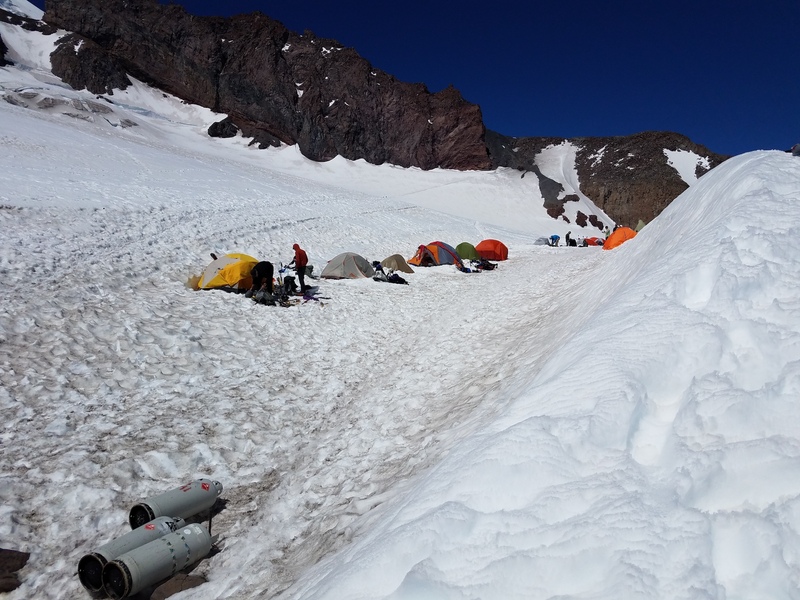 Line of tents at Camp Muir. Ours are the second and third from the left. Taking a breather, after having set up our tent (picture by Jenny). 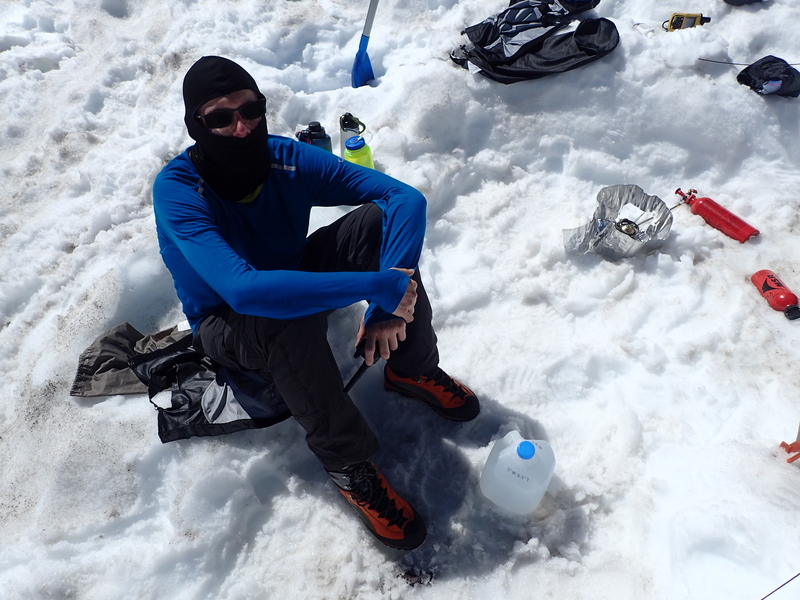 At Camp Muir, melting snow (picture by Vicki). We hadn’t heard from the skiers, and we were getting worried that something had happened and that they had turned around, but there wasn’t really anything we could do. Either they’d show up or not. Around 4:30 PM, I believe, I managed to call them on the two-way radio, and around 5 PM, perhaps, they were at our camp and setting up their tents. They weren’t too happy with our plan to get up at 11 PM and start hiking at midnight, so we agreed on an alpine start half an hour later. Jenny and I got up at 11 PM nonetheless and got our rope and gear ready. I put an alpine butterfly into the middle of my 40-meter rope, two alpine butterflies about 6 or 7 meters to the side from there, and then coiled up the rest of the rope, to be carried by the climbers at both ends. Fortunately, the glacier rope is really light. Vicki, Jenny and I were ready to go at half past midnight, as agreed, but the other team took until a little after 1 AM. 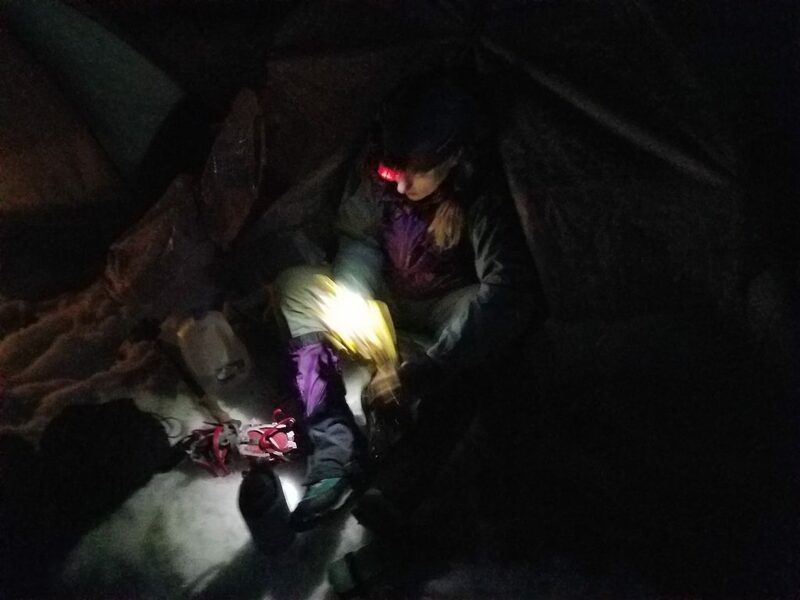 Jenny putting on her gaiters and crampons just before midnight. Ready to go at half past midnight! 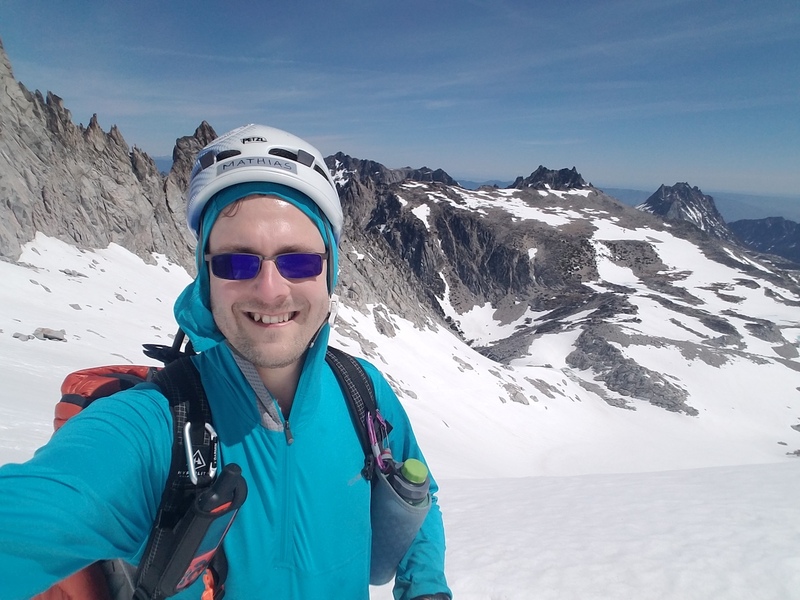 We followed a chain of headlamps in the distance over the Cowlitz Glacier towards the Cathedral Gap, crossed over onto the Ingraham Glacier, and headed up towards the Ingraham Flats. 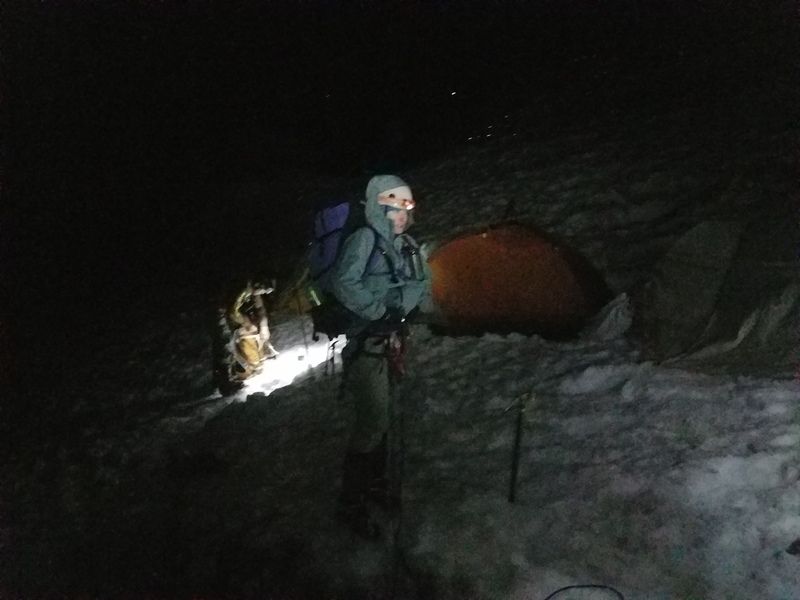 It was dark, our path only lit by our headlamps, and while we were pretty sure there were no crevasses on the boot path, I still swept my gaze left and right while I was in the lead. Around 11,300 feet, the path turned to the north and towards the Disappointment Cleaver. Some hand lines were attached, but we didn’t really need them. Ahead of us, there was a 3-person rope team that had used the entire length of a 30-meter rope, with 13 meters or so between climbers. They were relatively slow, and occasionally dislodged little rocks. About half-way up the cleaver, they sat down to adjust their rope spacing. With their headlamps shining straight into my eyes, I had trouble finding the route for a second, and when we spotted it, we realized I had ascended too far. We swapped leads, since Vicki was right around the correct spots, and she lead most of the way to the summit. 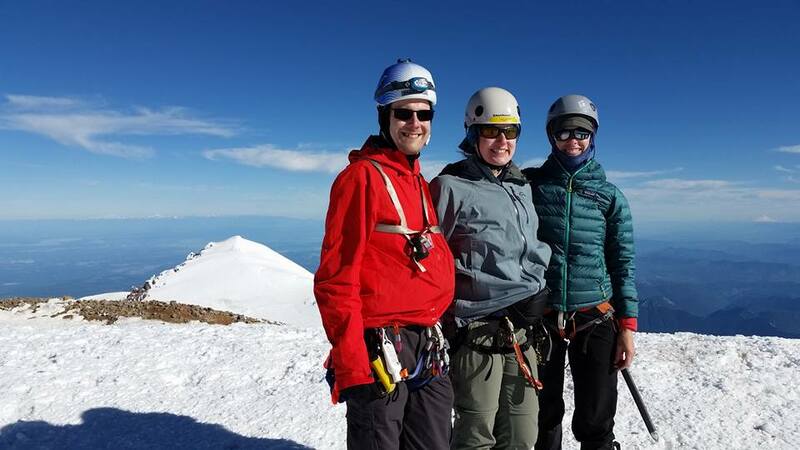 On top of the Disappointment Cleaver, our second rope team told us that, unfortunately, one of the climbers had altitude sickness. We polled every single person if it was okay for Vicki, Jenny and me to continue. I felt a bit bad, but the Disappointment Cleaver route had been pretty simple up to that point, and there were plenty of other climbers around who could help. On the Emmons route, we all would have had to descend, to make sure the second rope team doesn’t get in trouble on the way down (and to make sure we don’t get in trouble by ourselves on the way up). Mount Adams from above the Disappointment Cleaver (picture by Phil). The three of us continued by ourselves, and at around 12,800 feet arrived at what was arguably the most interesting feature of the route. First, we observed the sunrise, painting the mountain in a warm, orange glow. 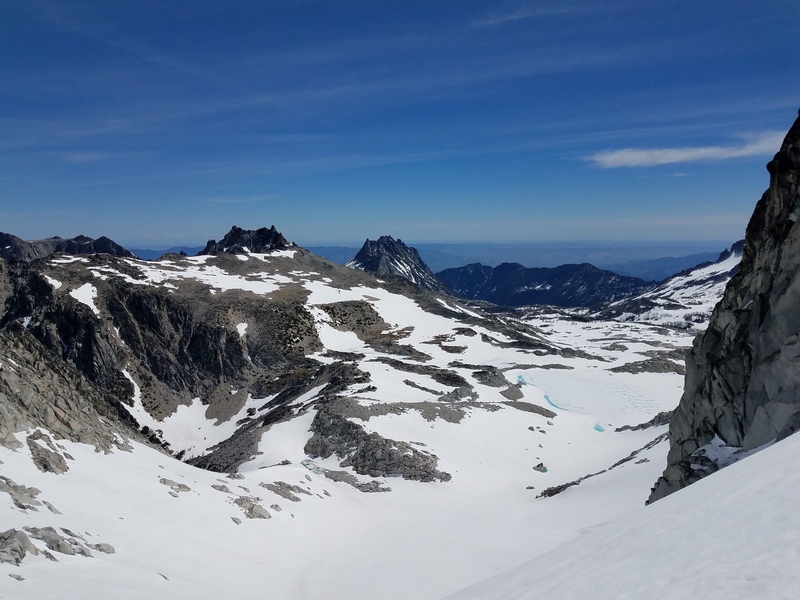 Then we followed a long detour towards the north to avoid a serac, to a point where we could actually see Mount Ruth, and almost see Camp Schurman. On our left, there was the steep serac; on our right, there were crevasses. We carefully but quickly made our way through this fascinating area (not many pictures of this, but here’s a video of our descent through the same stretch). 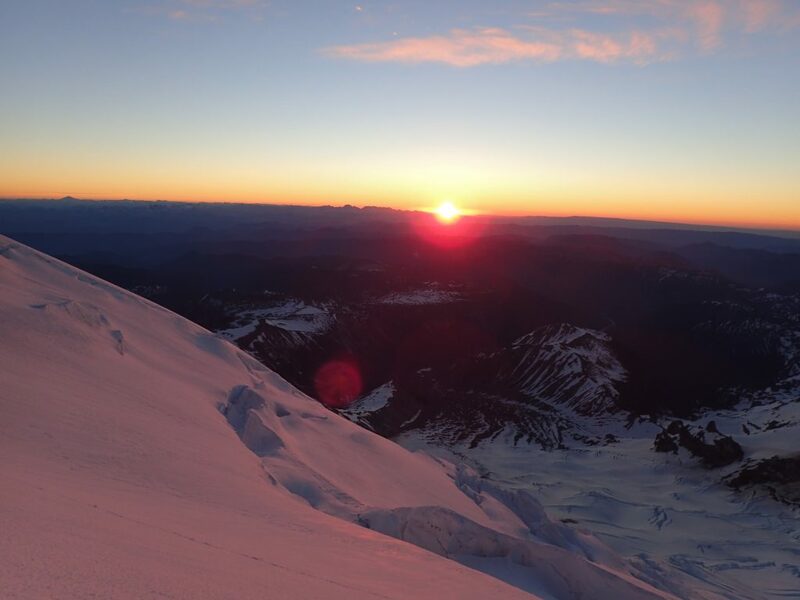 Sunrise at 12,800 feet (picture by Jenny). Vicki, leading our rope team at sunrise (picture by Jenny). I was bringing up the rear at this time. Behind me is another team (picture by Jenny). 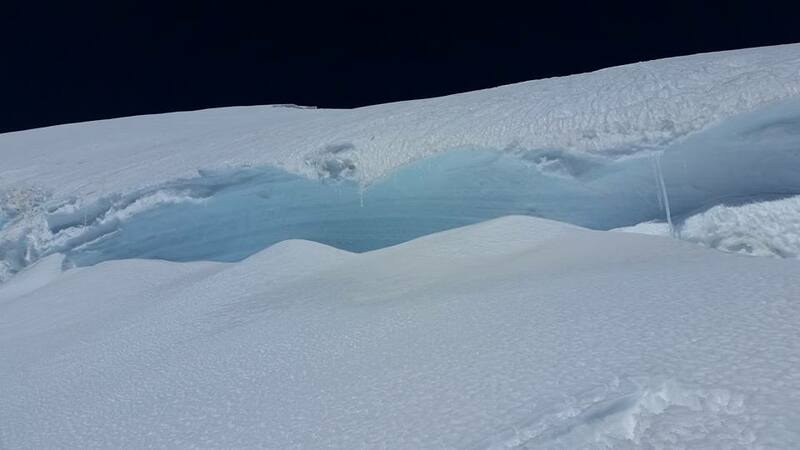 Icefall above us at about 12,800 feet (picture by Vicki). There were pickets and carabiners, but we decided to not use them, since it would slow us down. This was probably a mistake. We either should have clipped into the fixed protection, or we should have unroped. Oh well… we didn’t fall. After the detour, we steadily headed up on the mountain to about 13,000 feet, at which point the switchbacks became steeper. A bit higher still, maybe at 13,500 feet, we switched leads again, and I lead our team to the crater rim at 14,000 feet. Jenny and Vicki on a switchback near 13,000 feet. Re-applying sunscreen. Still got a bit burned (picture by Jenny). It was getting pretty hot. I’m pretty sure the dark peak in the foreground on the left is Mount Ruth. The trail behind us above 13,000 feet. Little Tahoma appearing very little from the upper mountain. Little Tahoma from the upper mountain (picture by Vicky). It was a remarkable sight. The crater was much larger than I had thought, the size of several football fields. There was no wind. It was absolutely tranquil. 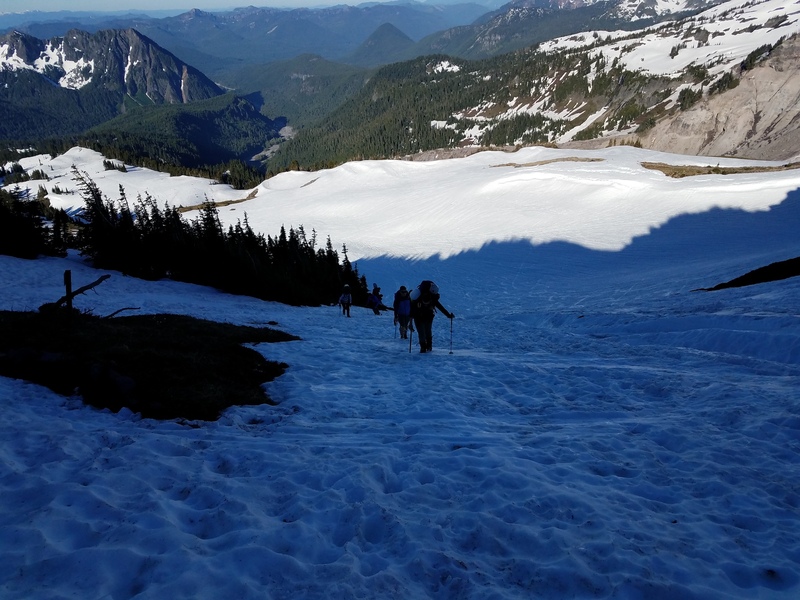 We dropped our packs and unroped, ate and drank a bit, and then headed across the crater to the Columbia Crest, Mount Rainier’s true summit. We reached it at 8:29 AM, after a bit under seven and a half hours of hiking. 9 AM would have been our turn-around time. Vicki, relieved at the crater (picture by Jenny). Jenny and I shortly after having reached the crater at 14,000 feet (picture by Vicki). The views were incredible. We could see the Olympics and Mount Olympus clearly. 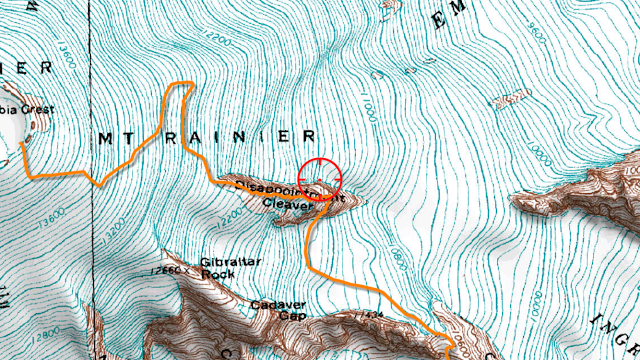 Baker and Shuksan were there. Glacier Peak. The Stuart range. Mount Adams. Mount Hood and Mount Jefferson. And Mount St. Helens. Absolutely beautiful. 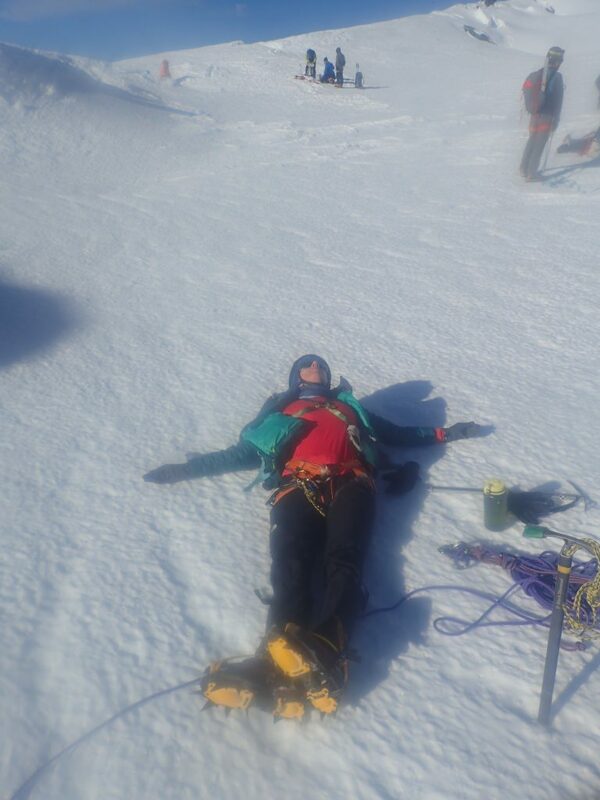 Jenny has reached the Columbia Crest! 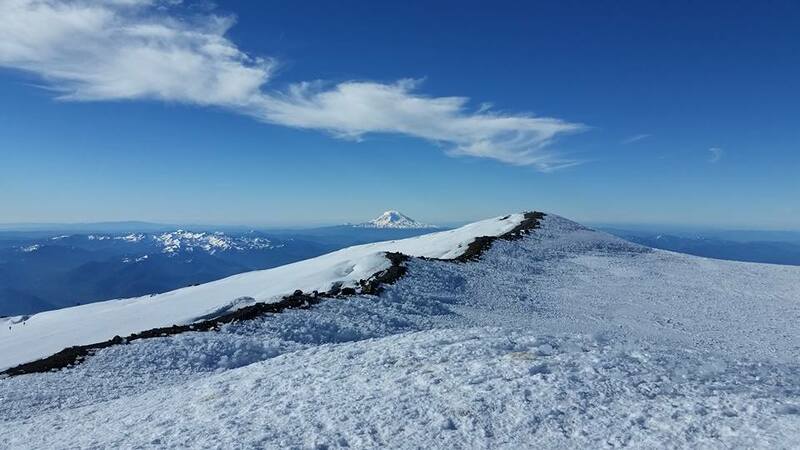 Mount Adams, as seen from Columbia Crest (picture by Vicki). Jenny, Vicki and I on the summit, with Liberty Cap in the background. 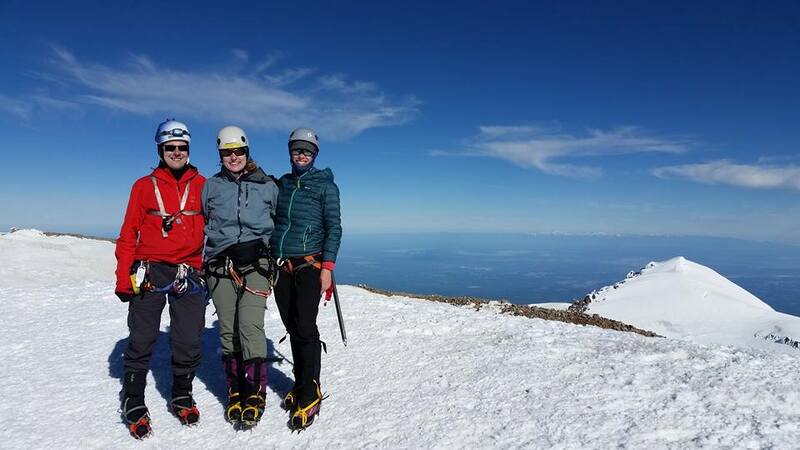 Vicki, Jenny and I on the Columbia Crest, Mount Rainier’s summit. 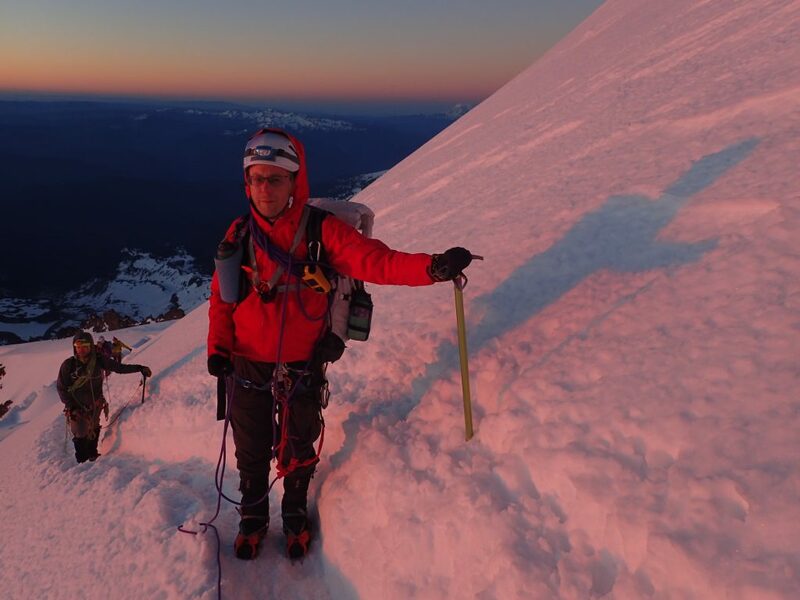 On the summit of Mount Rainier. We took some pictures and looked for the summit register, but couldn’t find it. We didn’t care too much. 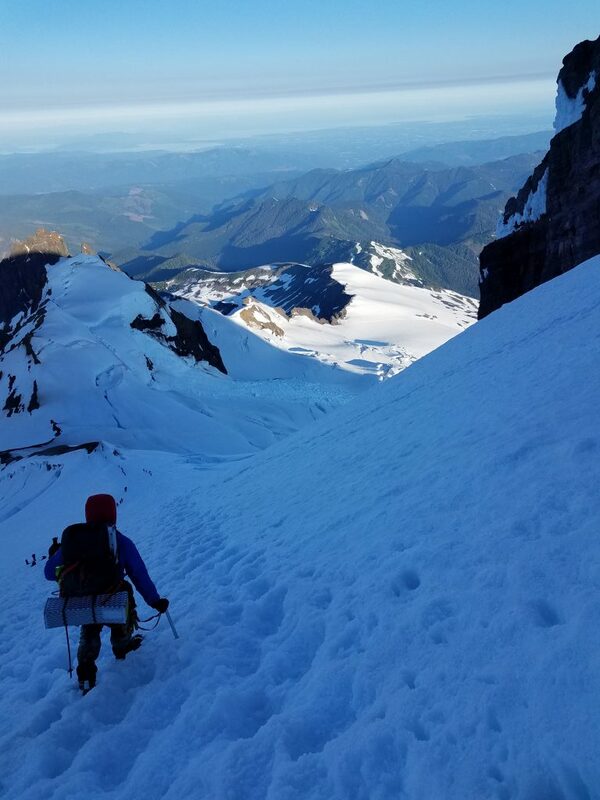 We returned to our packs via the south rim and good views of Mount Adams, ate a bit more, and then roped up for our descent. Jenny and I on the descent, high up on the mountain (picture by Vicki). I lead the first half down, right to the top of the Disappointment Cleaver. The snow had got quite soft by now, and our going was slow. Before the cleaver, we switched up our positions, and had Jenny lead, with Vicki in the middle, and myself taking up the rear. The cleaver was a bit tricky, but I must have bad memory, because it was much shorter than I had expected. Good! 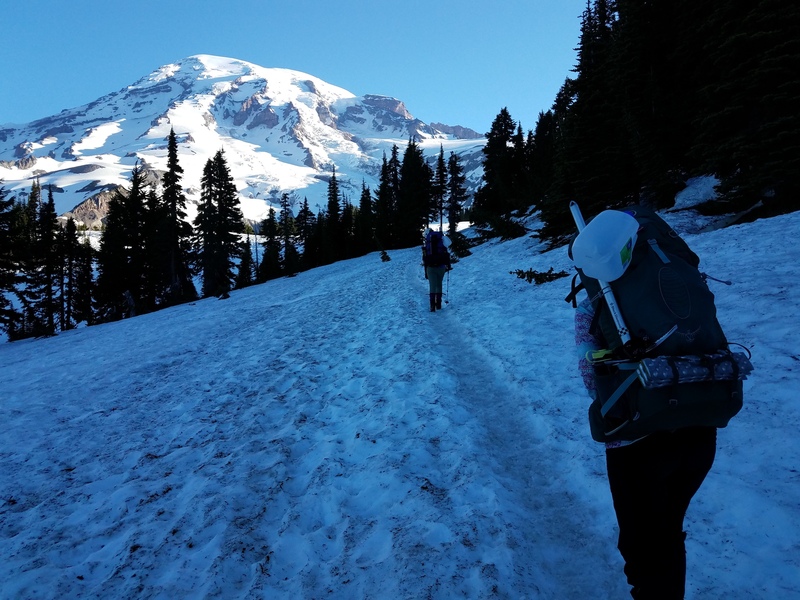 We cleared the cleaver and the icefall called Icebox quickly and headed back towards Ingraham Flats. While on the cleaver, our second rope team tried to radio us from camp, but we couldn’t respond, the situation was just too difficult to stop and radio. 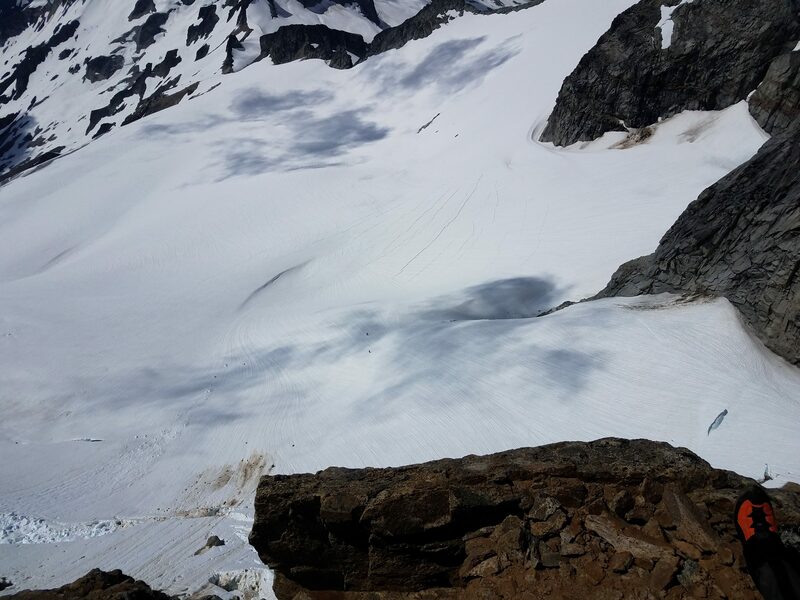 Once we were back on the Ingraham Glacier, we tried to call back, but they must have already descended towards Paradise. 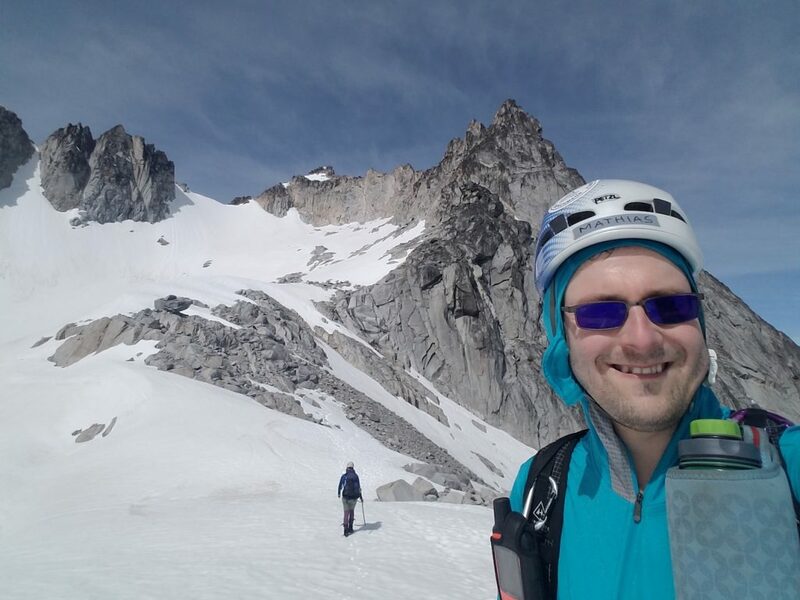 We hopped over the Cathedral Gap again and were back on the Cowlitz Glacier. At this point, I must admit, I ran a bit out of energy. 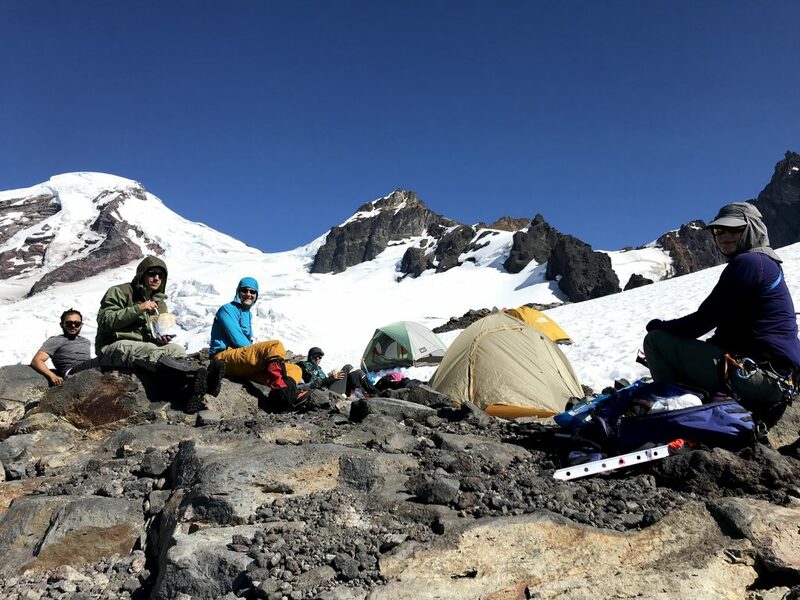 When we had stopped to snack, I had always spent some time with group tasks, such as looking at maps or trying to reach our second rope team, and I hadn’t eaten enough. 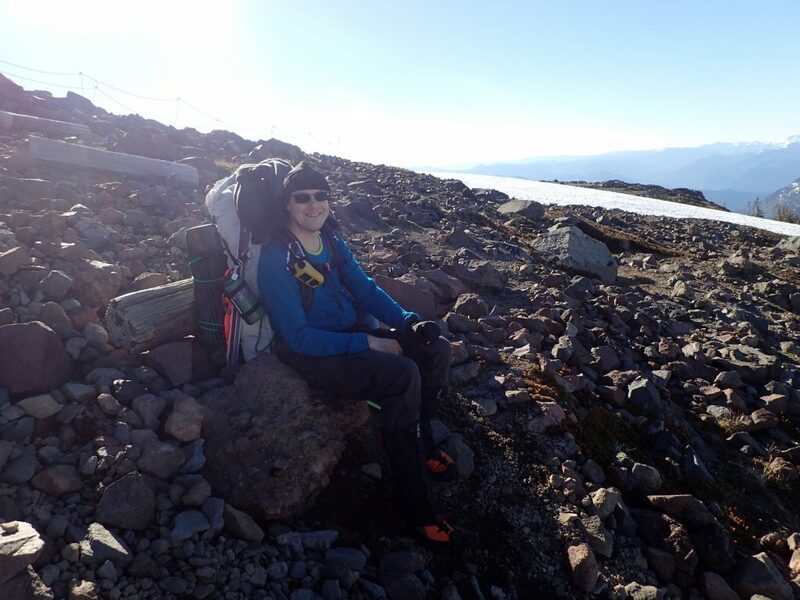 I was dead-tired by the time we reached Camp Muir again. It had taken us about four hours to get back to camp. We ate — the best Snickers bar of my life! — and took a brief nap, then packed up our tents. At 3 PM, we started the hike back down. Unfortunately, glissading didn’t quite work on the upper Muir Snowfield, but we hit a few decent glissades farther down. Just a few minutes after 7 PM, we were back at our cars. The hike out, with all our gear in our packs again, was long, but we made it. Jenny and I ate at the Basecamp Bar and Grill, and reached our home in Seattle at 11 PM. We had been up for 24 hours. 24 amazing hours. Now, almost three days later, I still haven’t come down the mountain. I’m still high. Jenny and I will most likely try to go up again later this year, on the Emmons route, if possible. 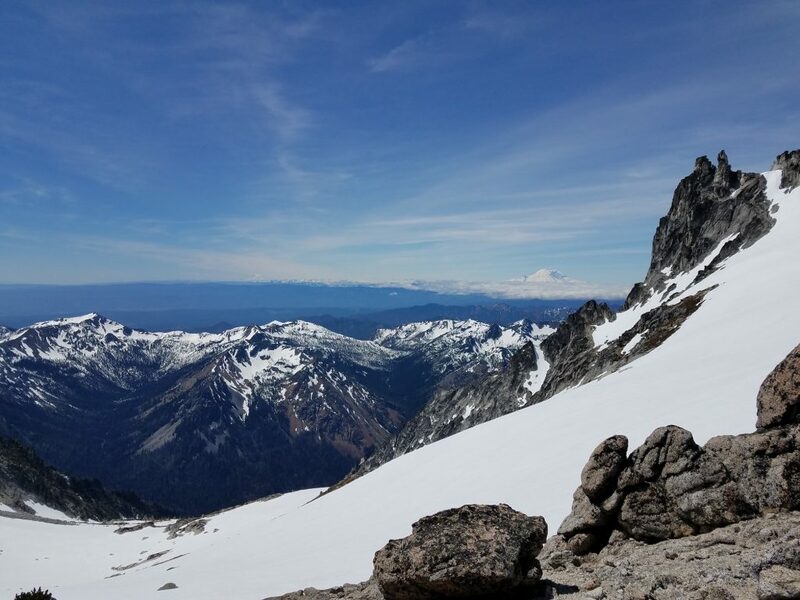 And we’ve already signed up for a three-day climb this next weekend, to Dome Peak, Washington’s 21st highest mountain (according to the Bulger list). 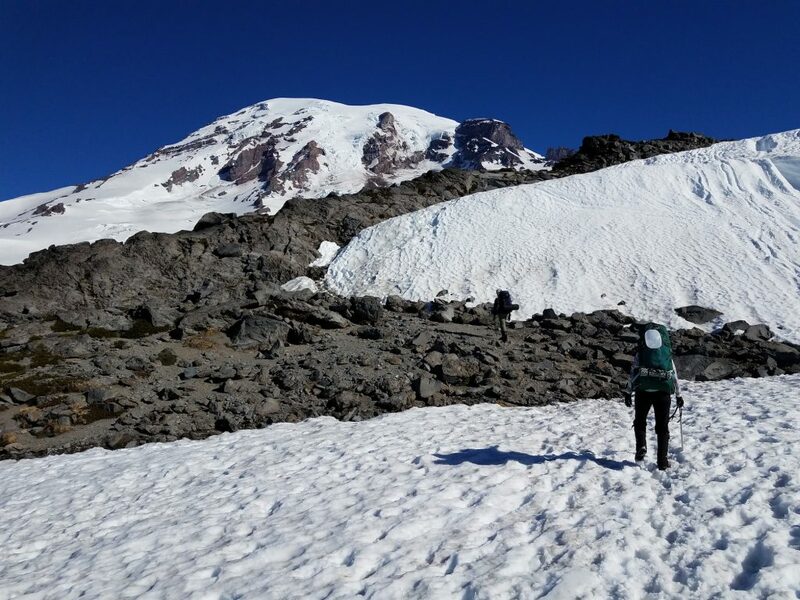 On Sunday, June 25, 2017, our friend Vicki, Jenny, and I summited Mount Rainier, the tallest mountain in Washington state. 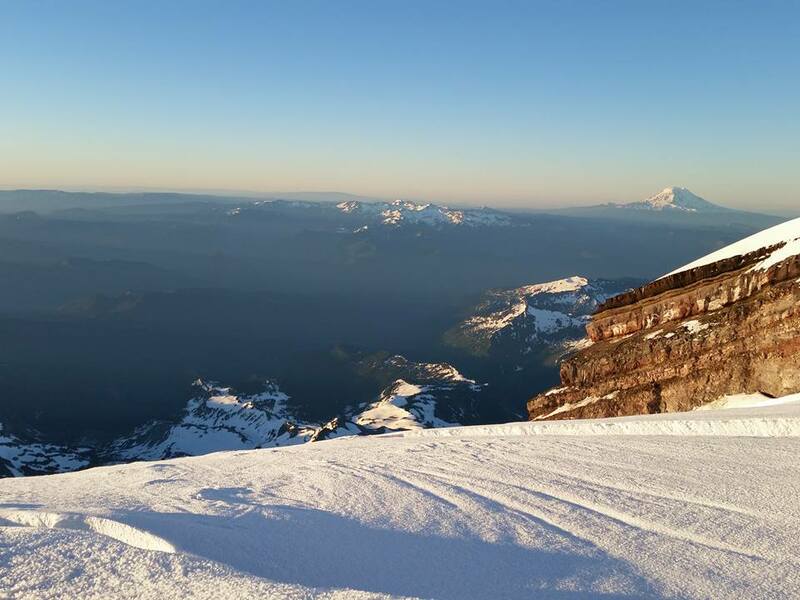 Mount Rainier is the most prominent mountain in the contiguous US (only Denali in Alaska and Mauna Kea on Hawaii are more prominent), and also the most glaciated mountain in the lower 48. This has been Jenny’s and my main project for the last four months, or so, and took hours, days, and weeks of organizing, conditioning, and planning. 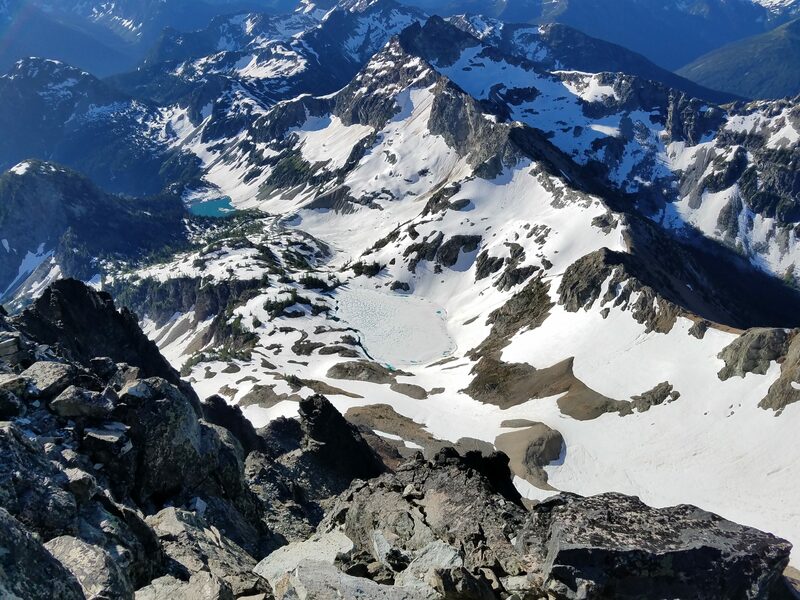 We went to Glacier Basin and Camp Schurman in preparation for it, we climbed Silver Star Mountain and The Fin to get used to double-header weekends, and we summited Colchuck Peak to get used to steep glaciers. 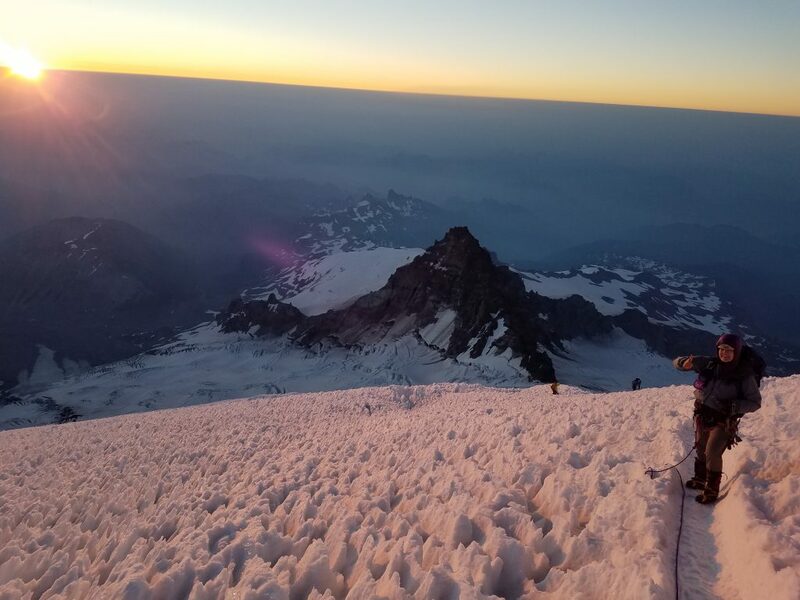 I hadn’t written about any of this, because I wasn’t sure that we would reach our goal of scaling Mount Rainier. 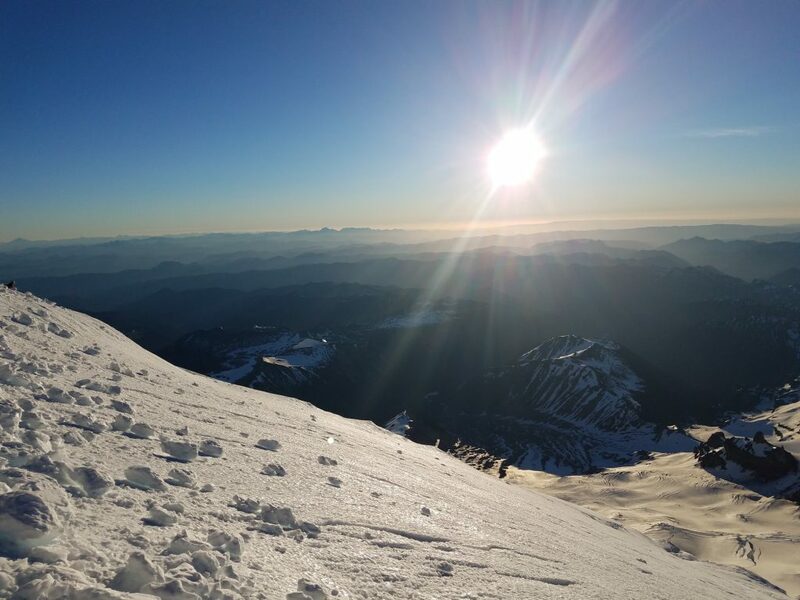 But now we have reached Mount Rainier’s summit, at 14,411 feet. Now I’ll start to slowly post more reports and pictures about the last few months. On one of my work projects right now, I’m adding unit tests to a code generator. The easiest way to make sure the generated code works is to run mvn clean install. Of course, I want to do that from within the unit test and fail the test if the Maven run fails. // start mvn with "Error: Could not find or load main class org.codehaus.plexus.classworlds.launcher.Launcher"
The interesting bit here is the request.setShellEnvironmentInherited(false); line. Without it, the MavenCommandLineBuilder.setShellEnvironment method adds an environment variable M2_HOME to it, which prevents Maven from starting up. I’m in the process of doing some housekeeping with my domains. In particular, I will drop the domains concutest.org and superscalar.org, among a few other, less frequently used domains. superscalar.org used to point to my old personal homepage, but since I hadn’t updated it in a while, I just pointed pointed it to my professional homepage, which had been available at www.ricken.us for years already. superscalar.org will go away, www.ricken.us will stay. The story for concutest.org is a little more complex. It is the domain for my research project Concutest, but also had a subdomain mint.concutest.org for the Mint multi-stage Java research project I was a part of. There was also blog.concutest.org, which was a synonym for this blog at www.concurrentaffair.org; community.concutest.org, which was part of a community effort to identify concurrency invariants of the Java API, which I ended some time in 2016; and drjava.concutest.org, which hosted an internal DrJava blog, also taken offline in 2016. These subdomains are already active. I hope this will not cause too much inconvenience. 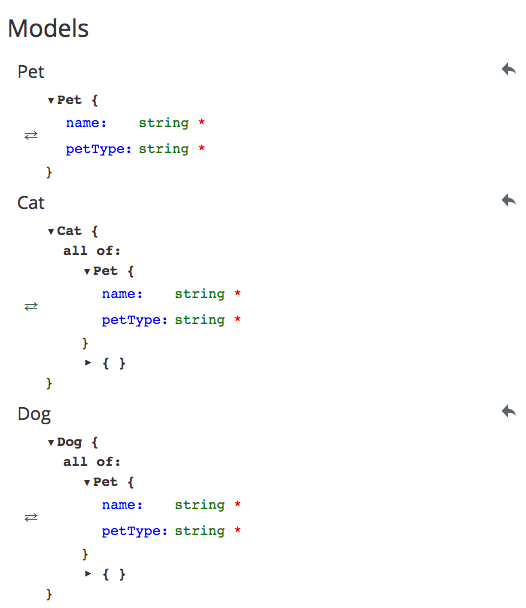 I recently had to write a query API for items in a service. Each item has a numerical, consecutively increasing integer as identifier. Therefore, it made sense to allow callers to specify a range. It also makes sense to specify the number of results to be returned, since we don’t want the result to get too big. The numeric identifiers actually provide a natural way of pagination. Specifying a range using startId and endId is simple. So is startId and count. But endId and count is tricky. We can’t just start at endId - count + 1, because some of the items in that range might get filtered out because of other query settings, and then we’d return fewer than count items. Okay, so we include all items, filter first, and then return the last count items. That works, but that creates an unnecessarily long temporary list, which may cause memory problems. I solved this by using a NavigableMap, and when endId and count are used together, I process a reverse view of the Map using NavigableMap.descendingMap(). Then I can simply limit the number of items and after filtering reverse the list again. * Get a list of items. // NOTE: the cache currently holds all items ever created in memory... how could that possibly go wrong? I’m pretty happy with this solution for returning the right number of items, no matter how the range is specified. The big problem, however, is that the class already caches everything in memory before I added the query API. Therefore, this query change could be as well-written as possible, and the cache would still blow up the heap at some point.